Unless otherwise noted, the owner is the artist. 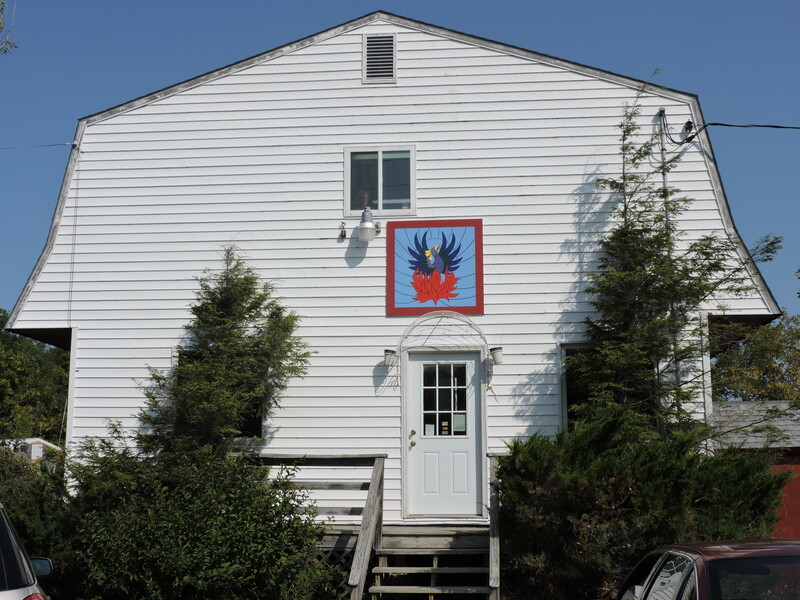 The barn quilts are listed in the same order as they appear on our trail map. 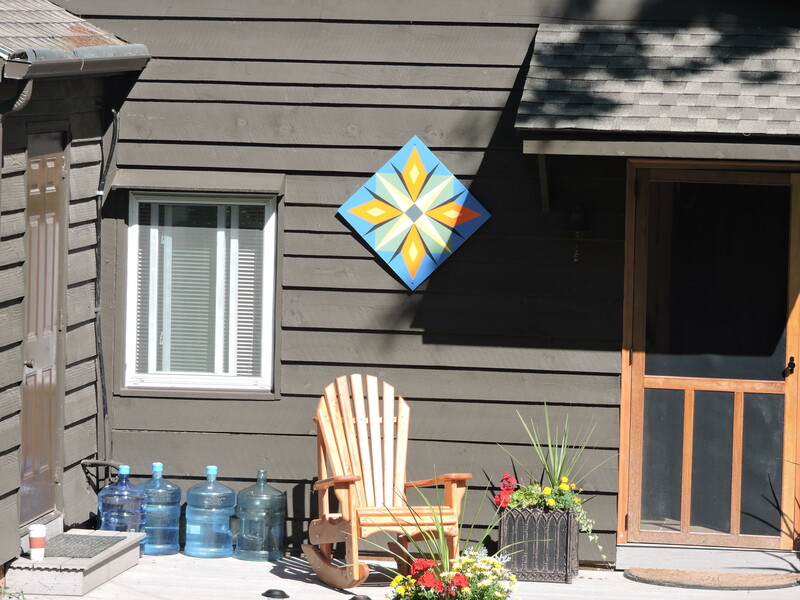 Along with a love affair with the North Country and the St. Lawrence River, my husband Paul was crazy about geometry. This block is based on one of his drawings. Mary Knapp was kind enough to draft it for me and liberated my color choices. The original drawing was done in a muted, restrained palette with pencil and pastel. 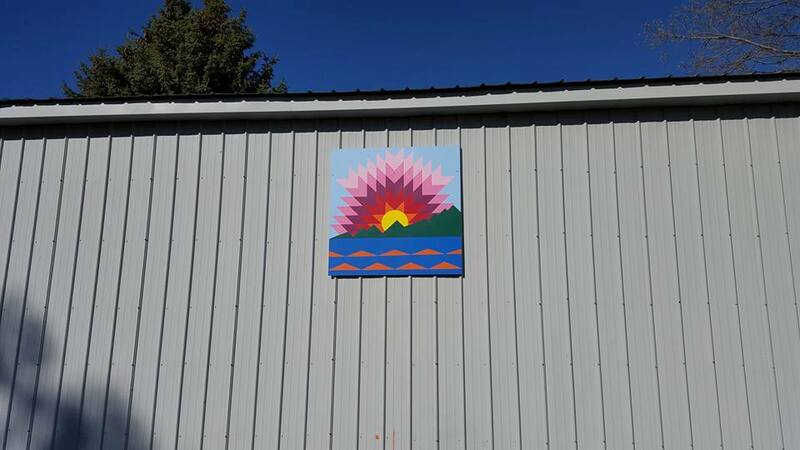 The block is intended to hang near the entryway to our new summer art gallery. The Celtic Three Hares is a mysterious motif that dates back to the Seventh Century. It can be found all along the Silk Route between China and the British Isles. It has been found in caves from ancient China and appears in many English, Irish and Scottish cathedrals. 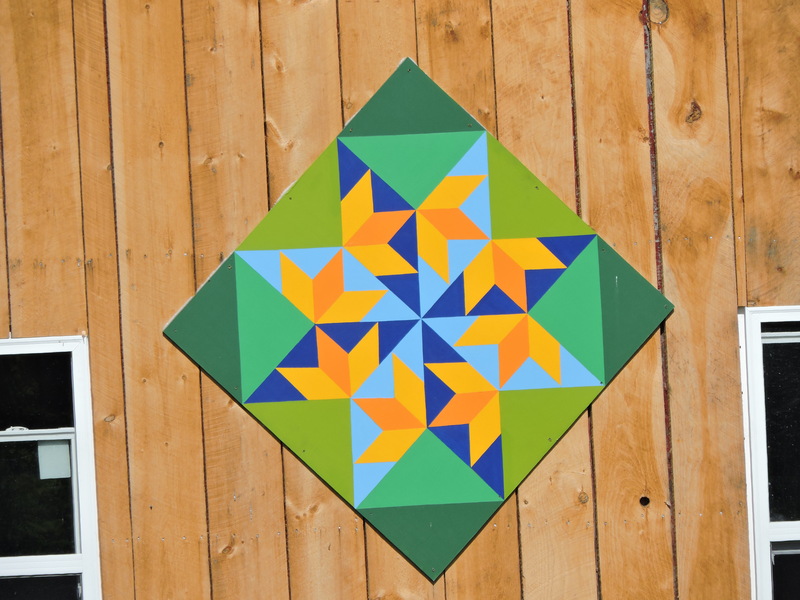 It has recently proved popular among quilters and barn quilters! This design appealed to me immediately for its Celtic reference – our house was built, owned and occupied by Scots and my mother was a Davidson – and also for its abstract incorporation of the three hares, as cottontails run rampant around our house. Many scholars have written about the mystery surrounding this motif and its mystical implications. 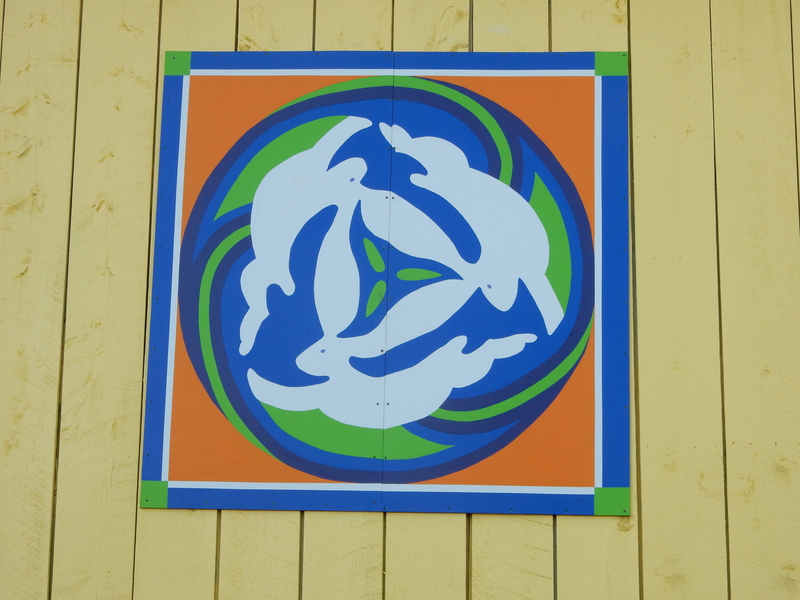 Traditionally, the Celtic knots in the design are more complex and the hares appear more abstract. 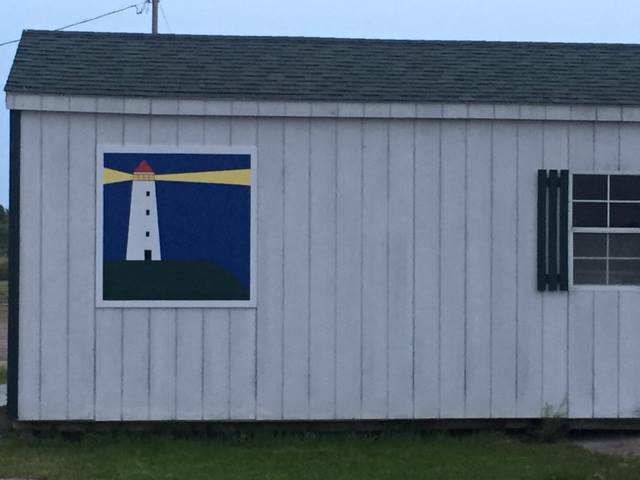 I asked Pam to simplify the design so that it could be appreciated from a distance. What Pam did is extraordinary! She simplified the knot and created an implied spiral. The hares in Pam’s design are filled with life and joy! 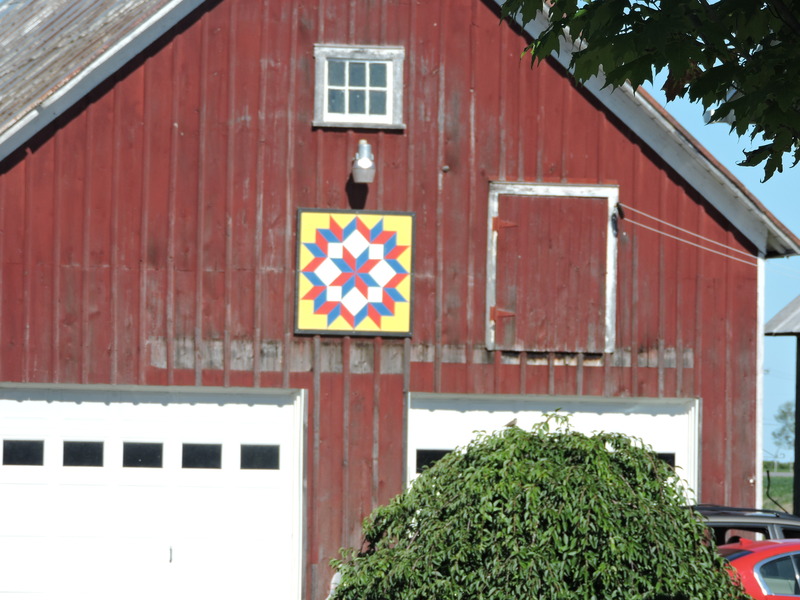 At Vintage Doors we are so proud to be the first business to host and hang a Barn Quilt in Hammond. 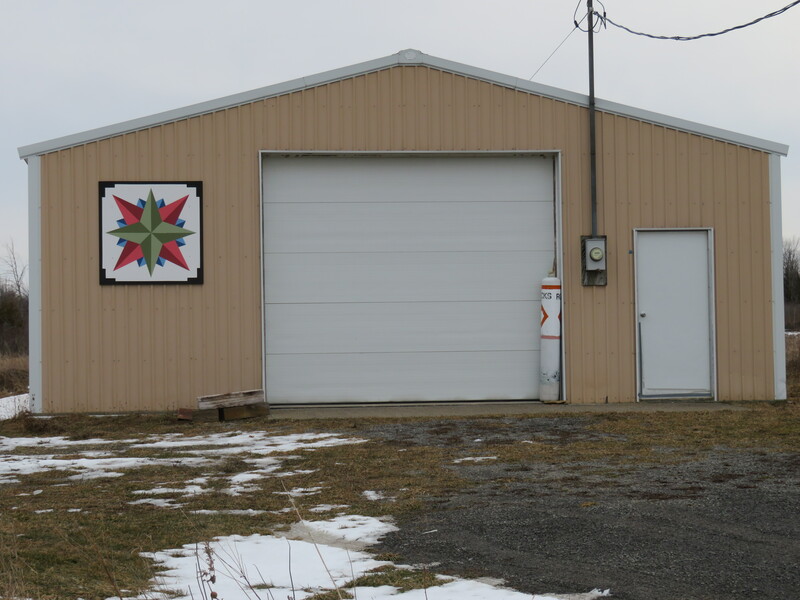 As such, it’s “proudly” displayed on the front of our building to ensure visibility from our main road (Route 37). 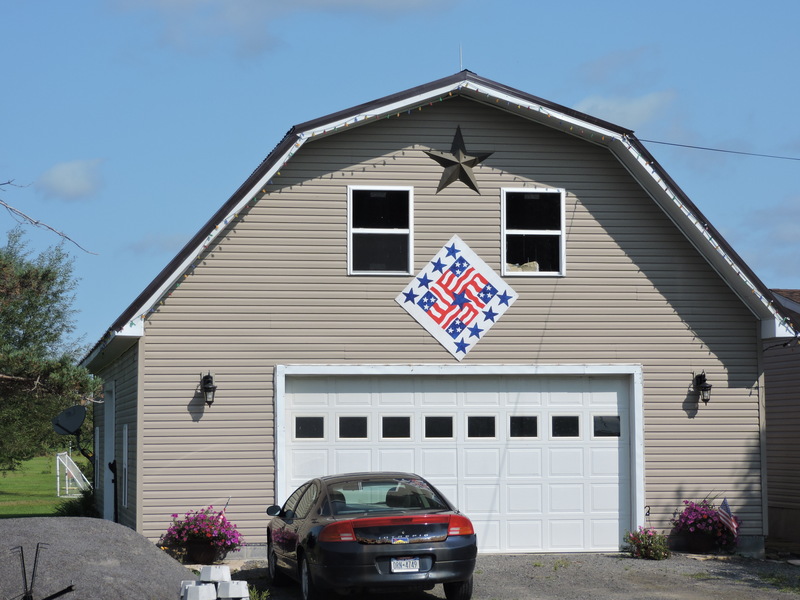 Our Barn Quilt is very patriotic – naturally! 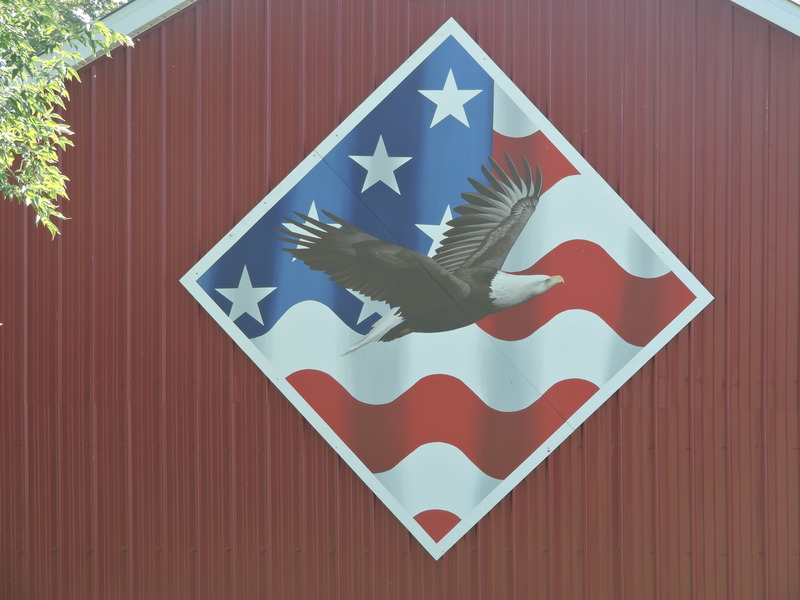 It represents “Pride” on a number of levels: 1) Pride in being a part of the quilt trail, 2) Pride in being a part of our town’s future, 3) Pride in hand-crafting AMERICAN made products in the U.S.A., and so much more! Sister star pattern. 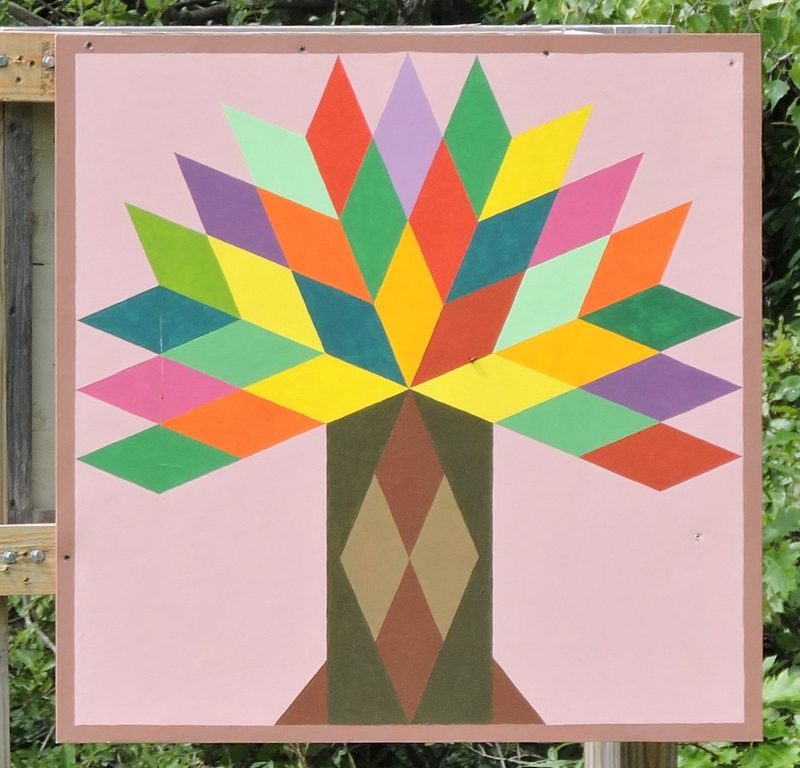 Two were created in 2009 by Jacqueline Washburn as a gift to her sister in celebration of her 60th birthday. 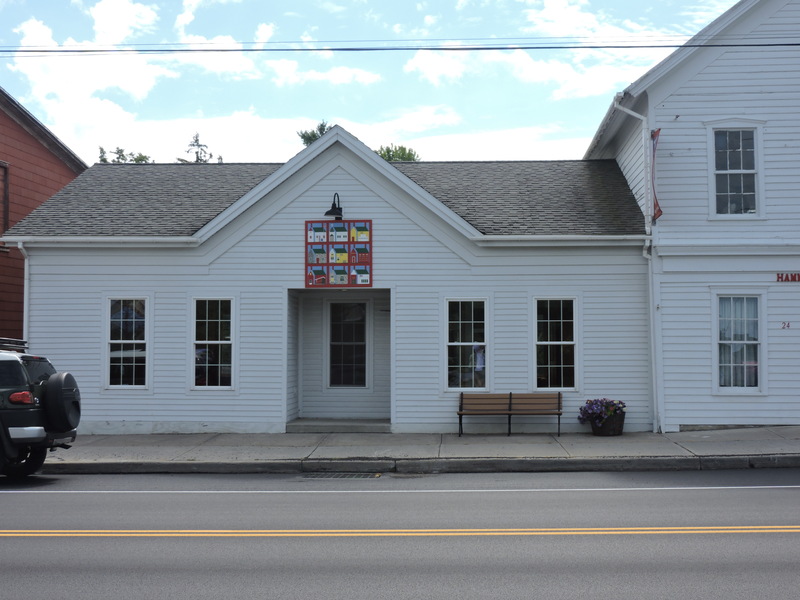 The matching quilt (sister quilt) is in Marshfield VT. 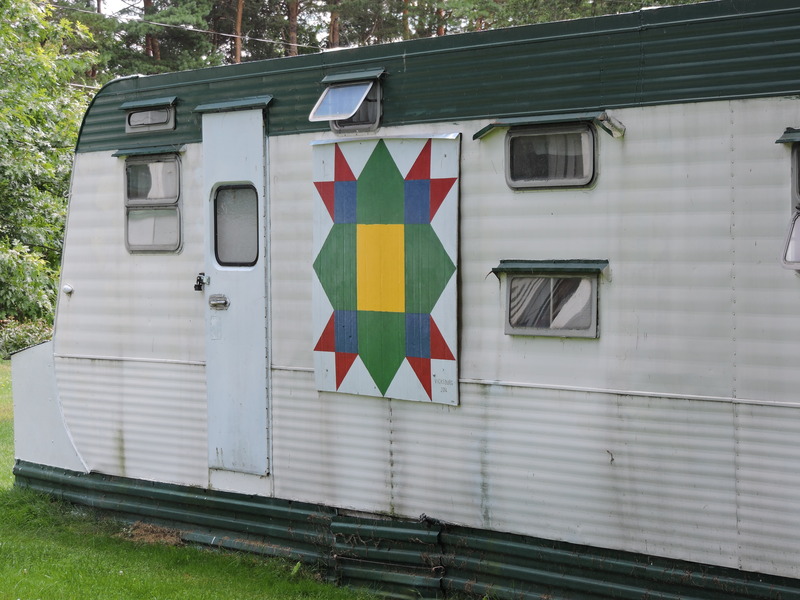 The quilt’s original home was in Macomb, NY, and was moved to Hammond after a fire that destroyed the family’s home. 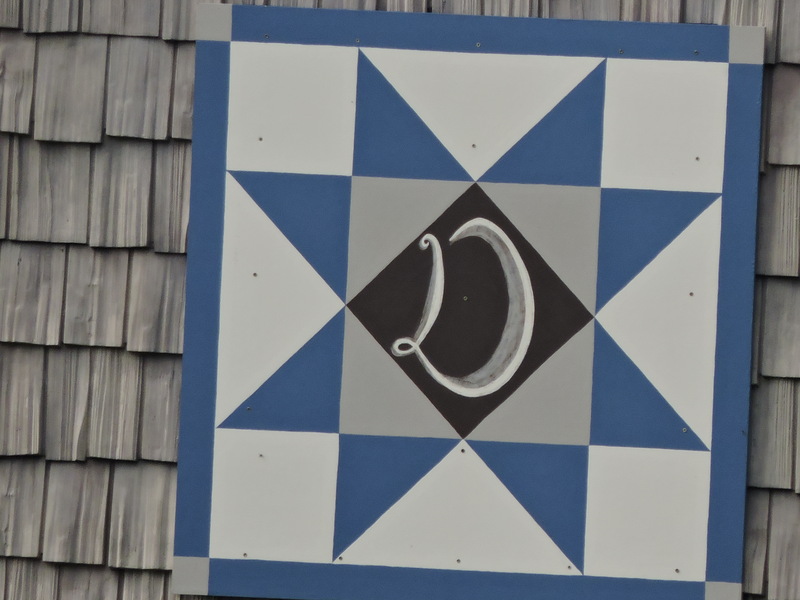 NOTE: This barn quilt was the very first one in Hammond – Jackie had it displayed years before the trail was even a thought. Thanks, Jackie and family! Our family loves apples! 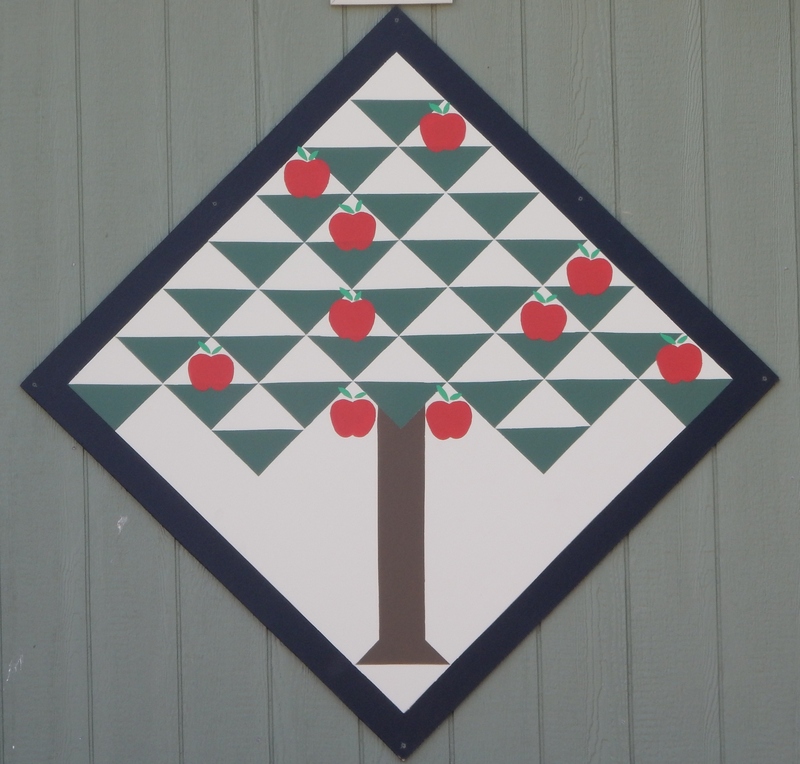 The whole family goes picking, then we invite friends and make cider with our cider press. At the cafe we serve Apple desserts. 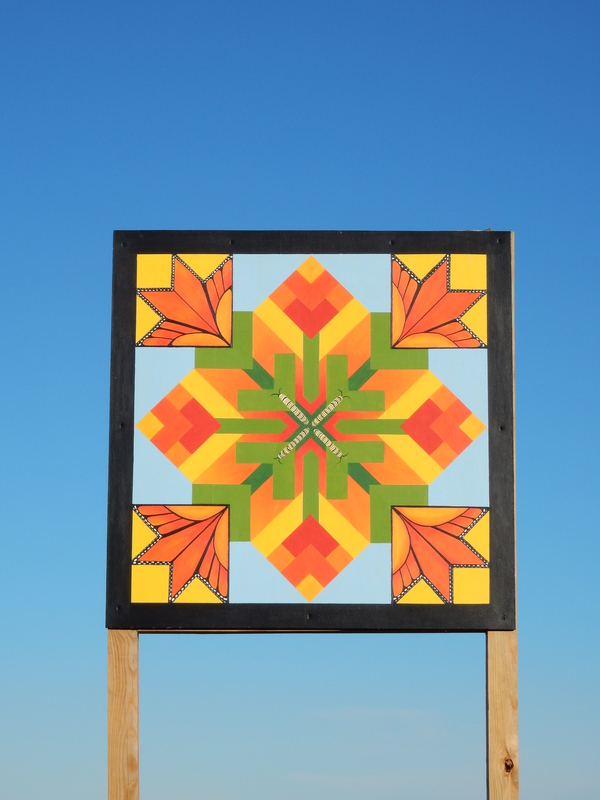 This quilt represents family togetherness and abundance. right – Hammond Central School. 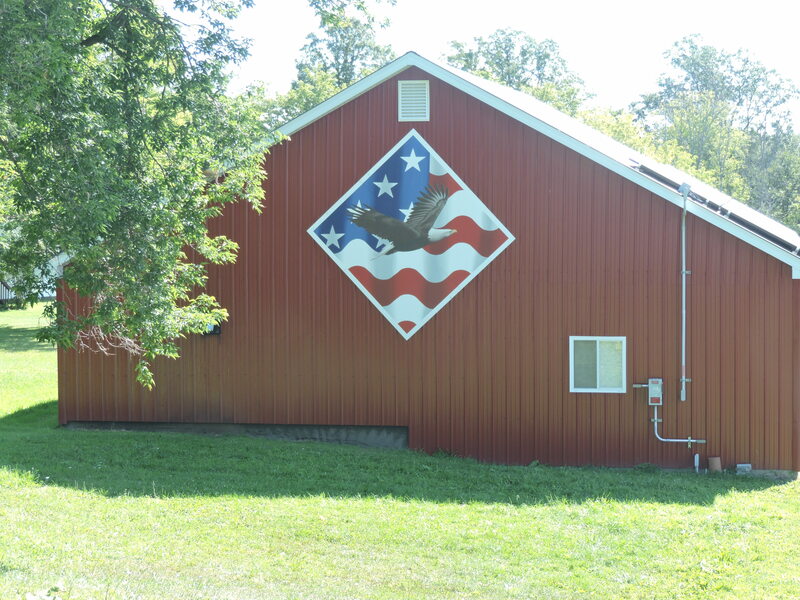 Ron was very clear he wanted our American flag on the barn, and Pam Winchester was able to turn his desire into a barn quilt, by using a design with a double arch quilt pattern for the arch and overlaying our national bird, the Bald Eagle. 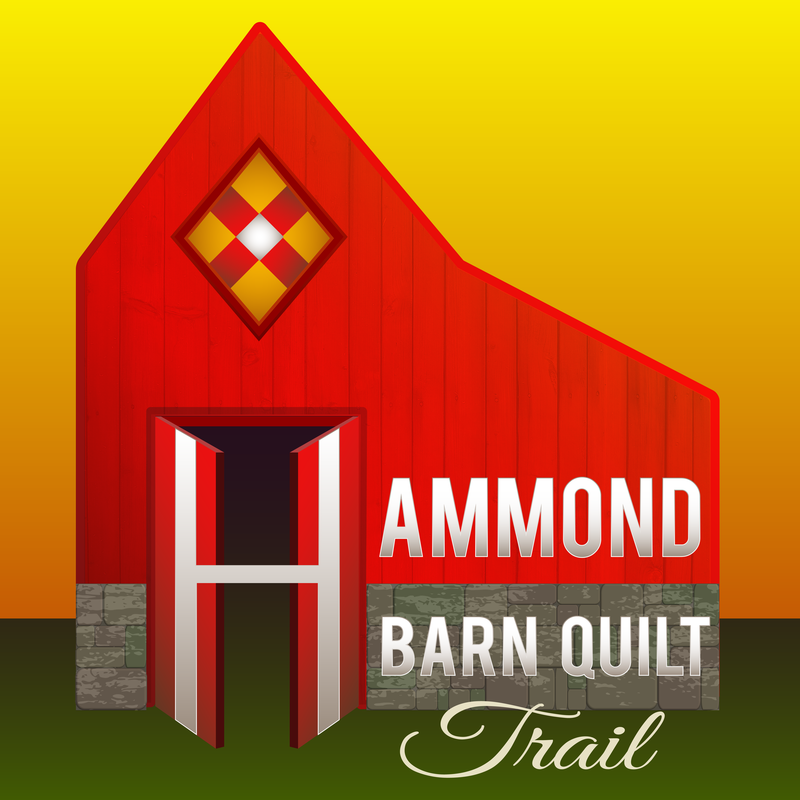 Ron chose the red color to match our red barn and we are thrilled with both our barn quilt and our participation in the Hammond Barn Quilt Trail. 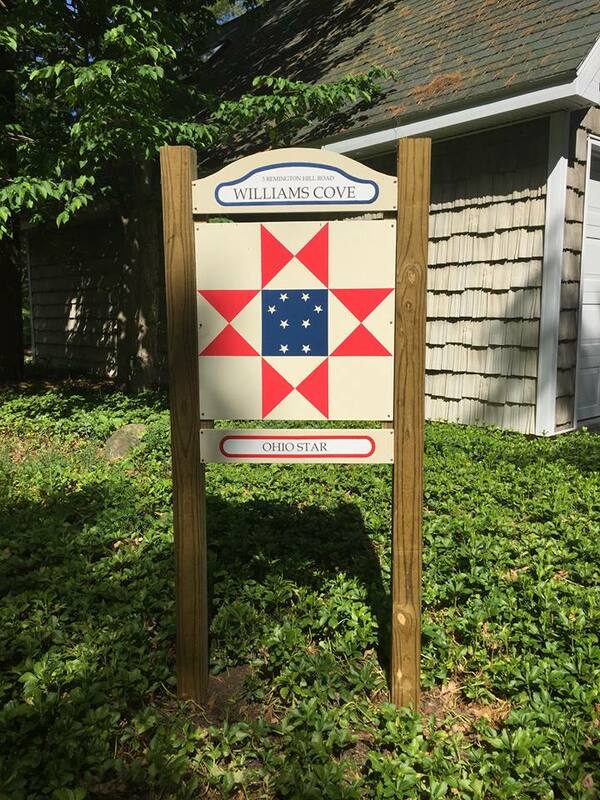 The center of the quilt is a stone house, which is representative of about 40 stone houses built in Hammond by Scottish immigrants. The top painting of the horse-drawn sled highlights the skilled woodcarving of R. T. Elethorp. Many of his carvings and model buildings are on display at the museum. The tree and corn stalk show that lumber and agriculture have played an important role in Hammond life. The plow on the bottom was a product of a Hammond company, Evans Manufacturing, in the early 1900s. 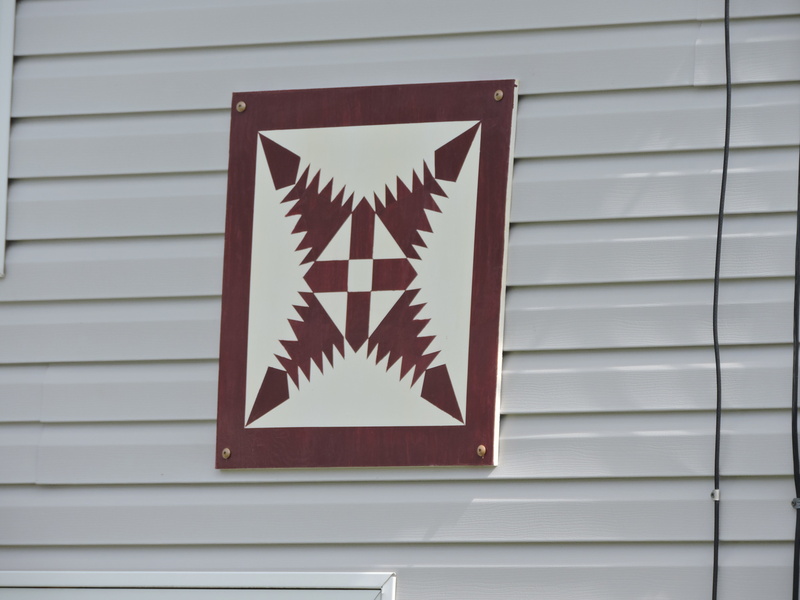 The symbols on each corner signify the origins of Hammond’s earliest settlers: strawberry – the Mohawk nation, thistle – Scotland, red clover – Vermont, and maple leaf – Canada. The double wedding ring pattern unites the various cultures that have settled here. 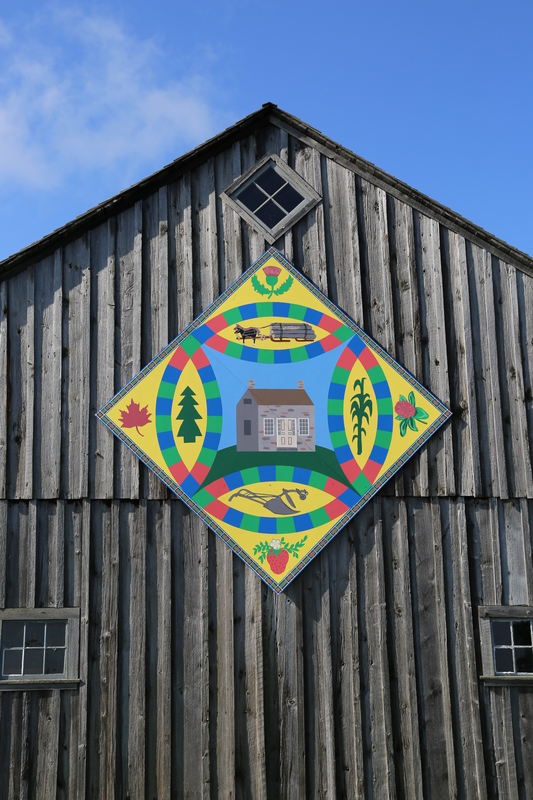 The plaid used on the perimeter of the Museum barn quilt is the St. Lawrence Tartan designed and produced in 1961 by Mrs. Helene Cobb, who left her trademark for the tartan to the Thousand Islands Museum in Clayton. 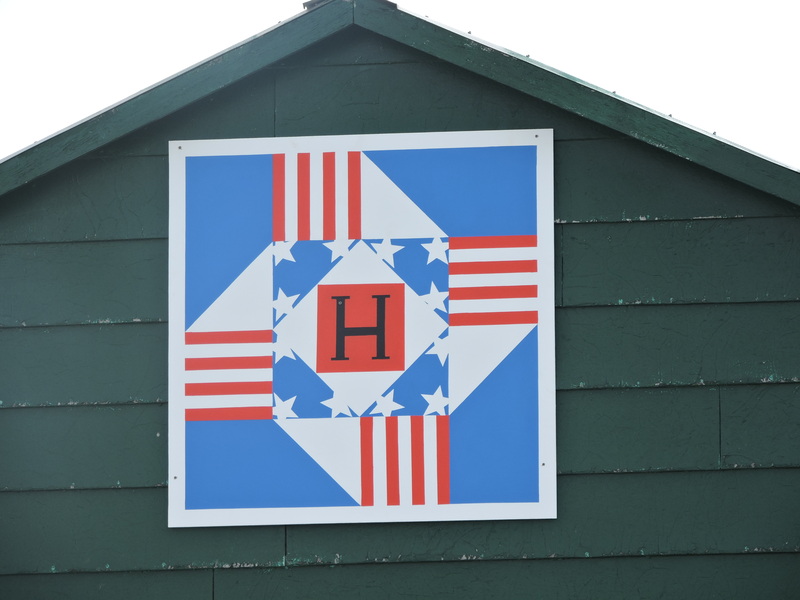 They have graciously allowed us to include the tartan on our barn quilt, representing our Hammond immigrants’ connection to the river. 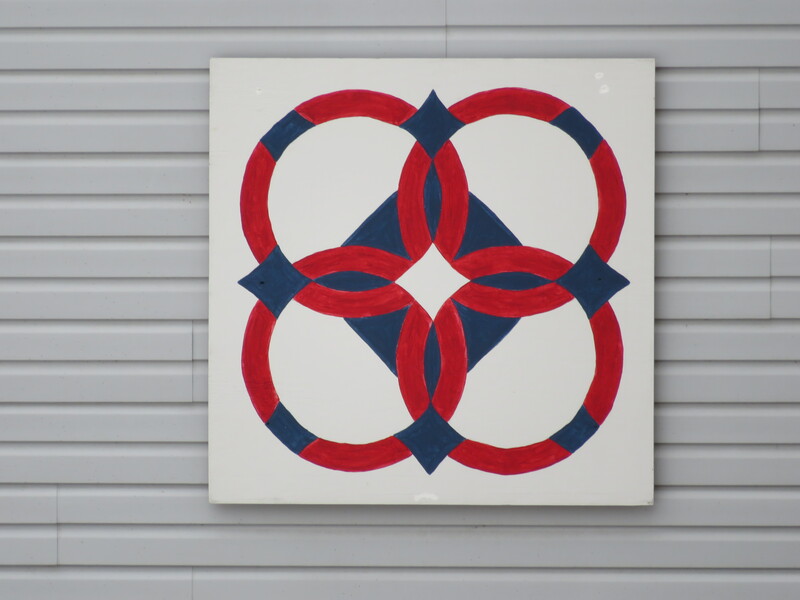 This quilt block was designed by Adeline Webb Brown pre 1936, and it was first published in the Chicago Tribune. 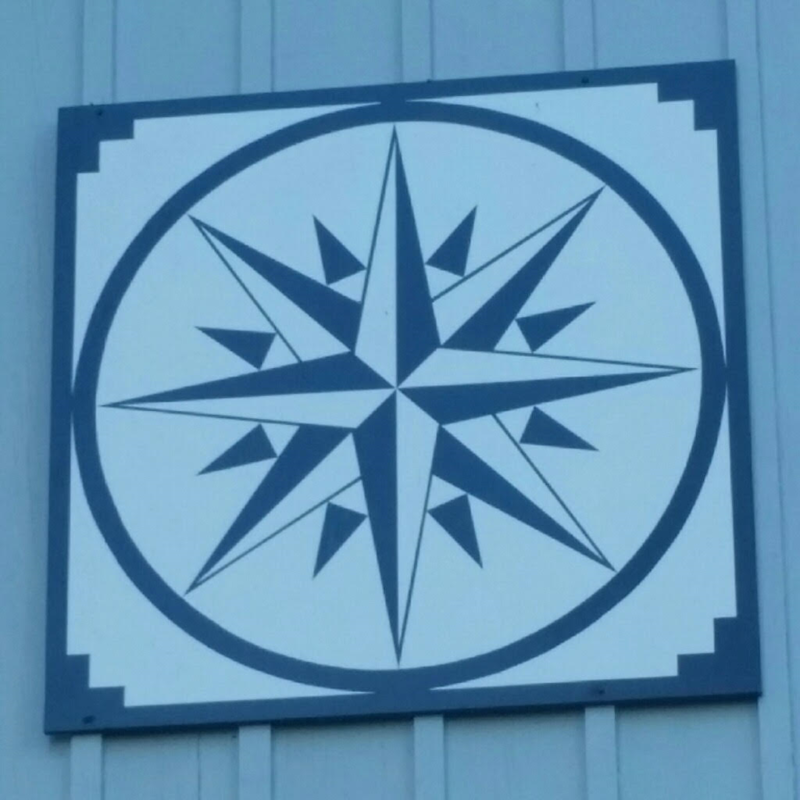 The design appealed to me because it looked like a star. 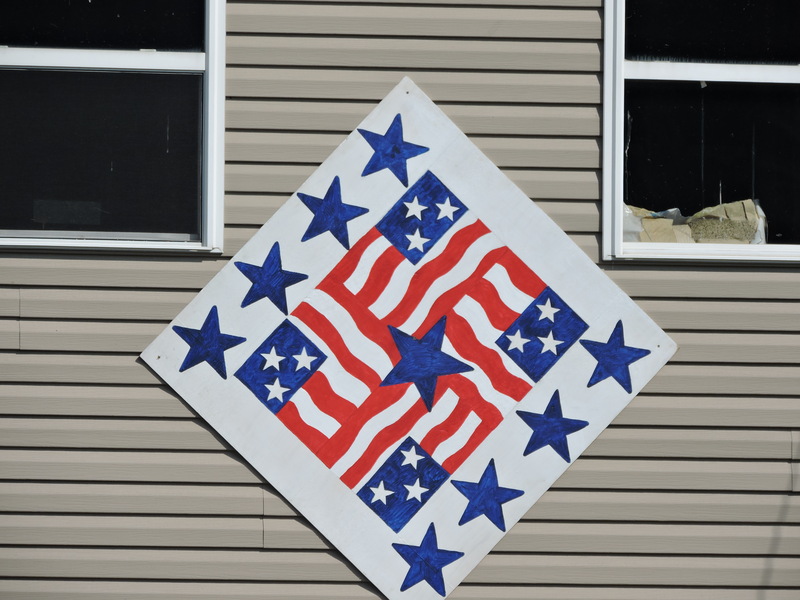 The patriotic design was selected the Town Board of Hammond in the early spring of 2015. 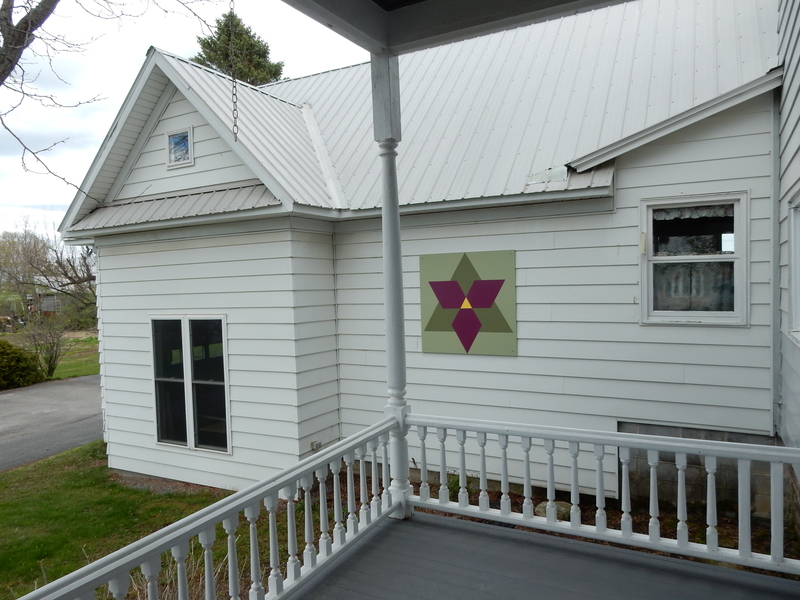 Many members of the Hammond Barn Quilt Trail committee joined Donnie Greene’s daughter, Julie, in painting it. 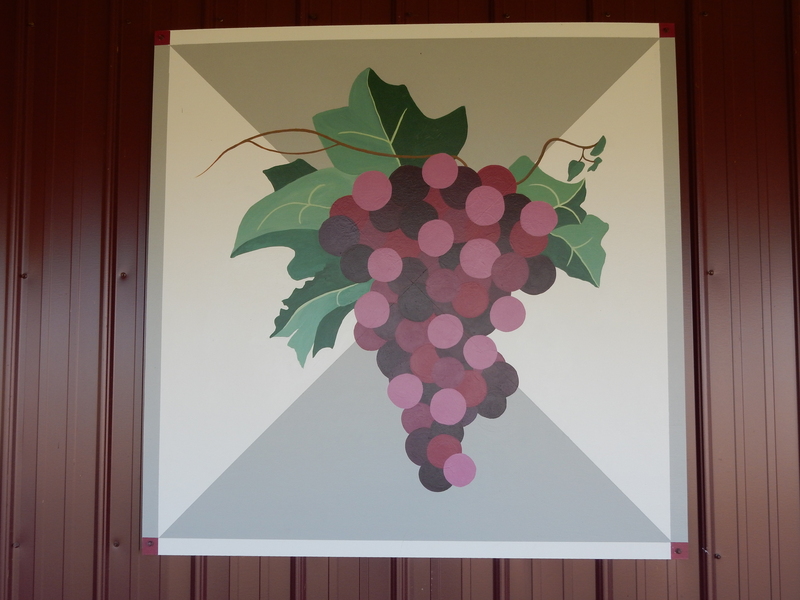 Grape Cluster was chosen to represent our Vineyard and Winery. 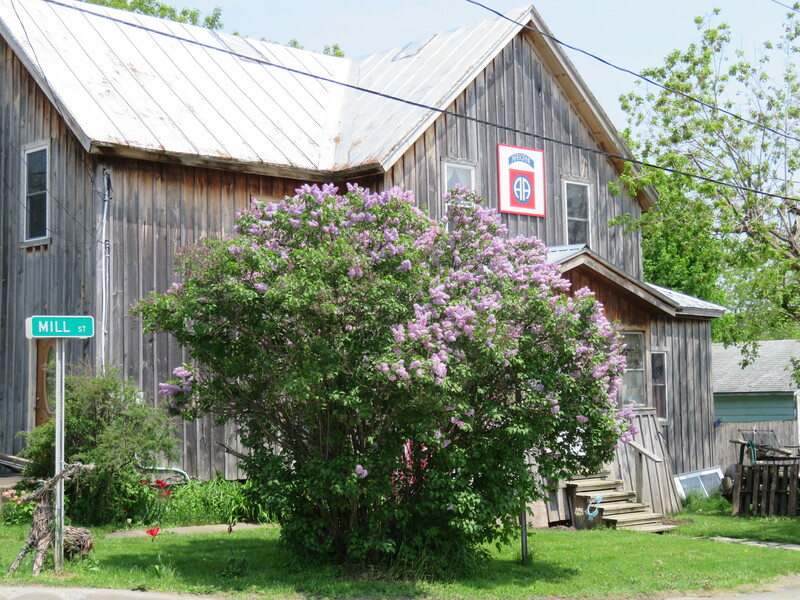 Bella-Brooke is the largest vineyard in St. Lawrence County. 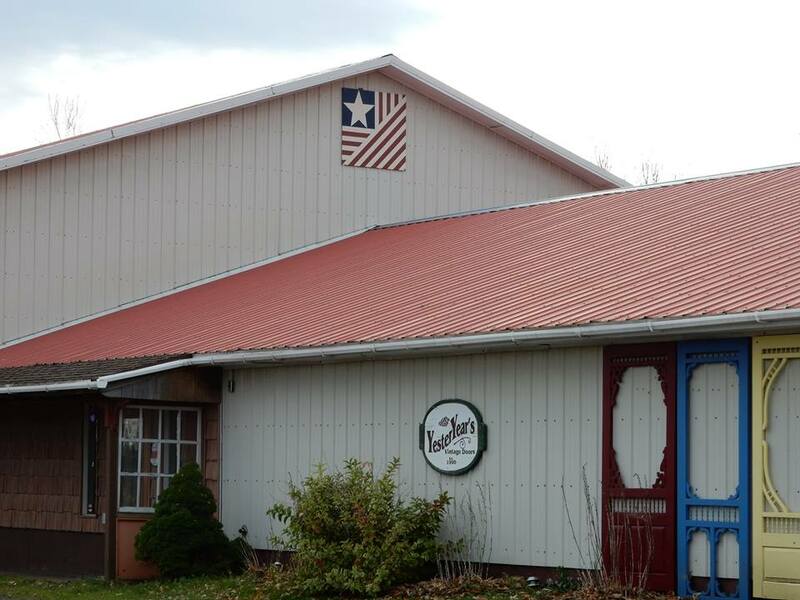 Vicksburg is the title of this barn quilt named after the city of Vicksburg, MS that was surrendered to the Union forces on July 4, 1863, just one day after the Confederate defeat at Gettysburg. 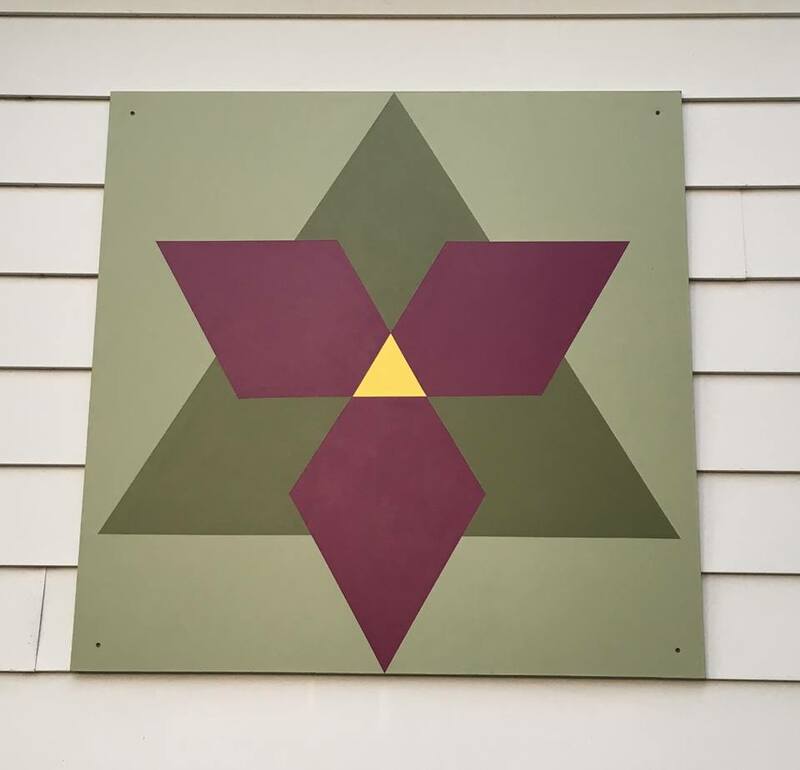 The painter, Chris Klenk, picked this design in remembrance of his great-grandfather, Garrett Snell, who served with the 37th Illinois regiment during the siege of Vicksburg. Garrett Snell, along with his two brothers, served in the 37th Illinois regiment and survived the war uninjured. 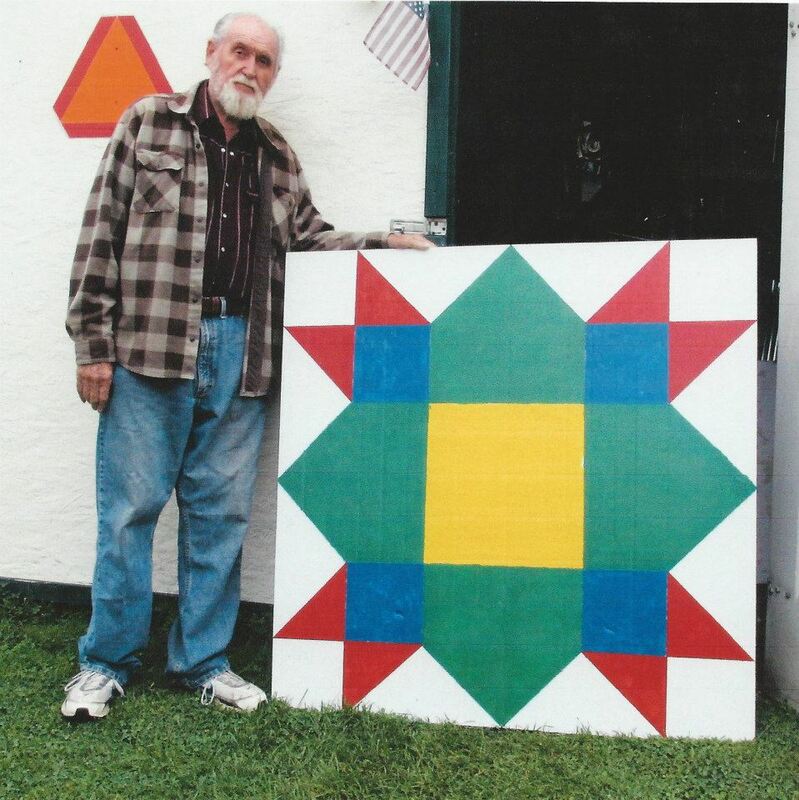 I created my barn quilt square to honor my Dad, Bob Gove. He was a real river person, being born and brought up on our beautiful St. Lawrence River. He also worked there for 40 years building wooden boats. He carved amazing detailed river ducks. 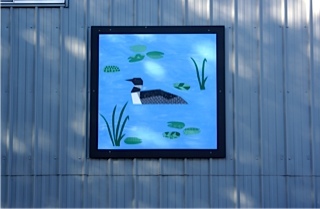 He also was a river artist, painting river scenes and ducks. This is to keep his legacy alive. The quilt was a Christmas present to my husband. 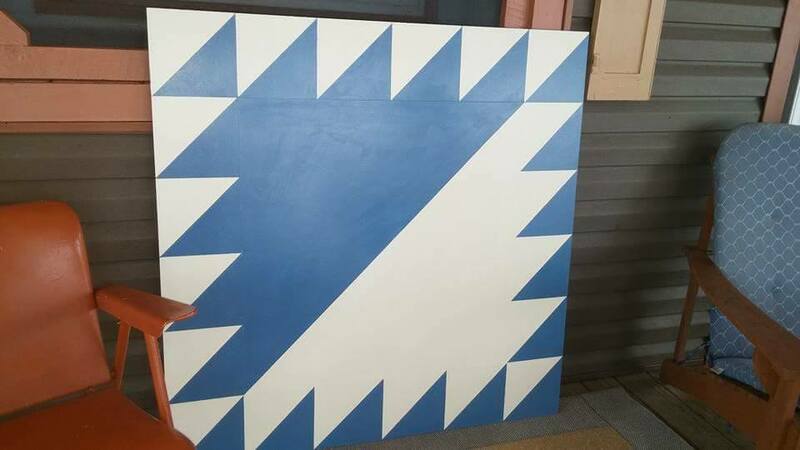 It was a surprise, so when we were out of state at a craft show, I asked him which painting of a quilt he liked. 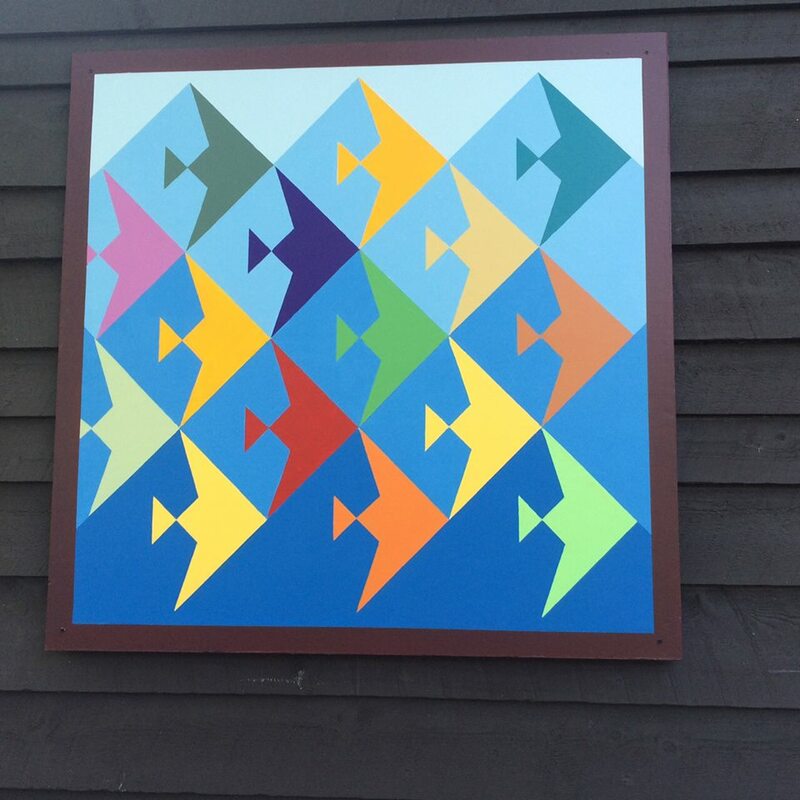 He chose, and my niece, Shani Schermerhorn, designed it, by taking a photo of the painting. We wanted the center to be our coat of arms. It was so intricate we decided to use our initial for our last name. Each of the points represents our families. 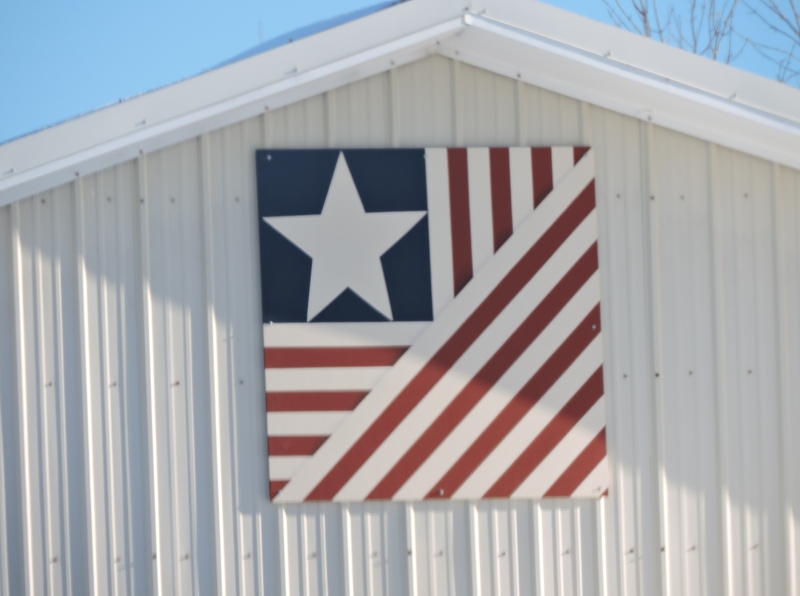 We chose the Carpenters Star to represent our business, Ace Contractors, and we chose the red, white and blue colors as the colors of the American flag. 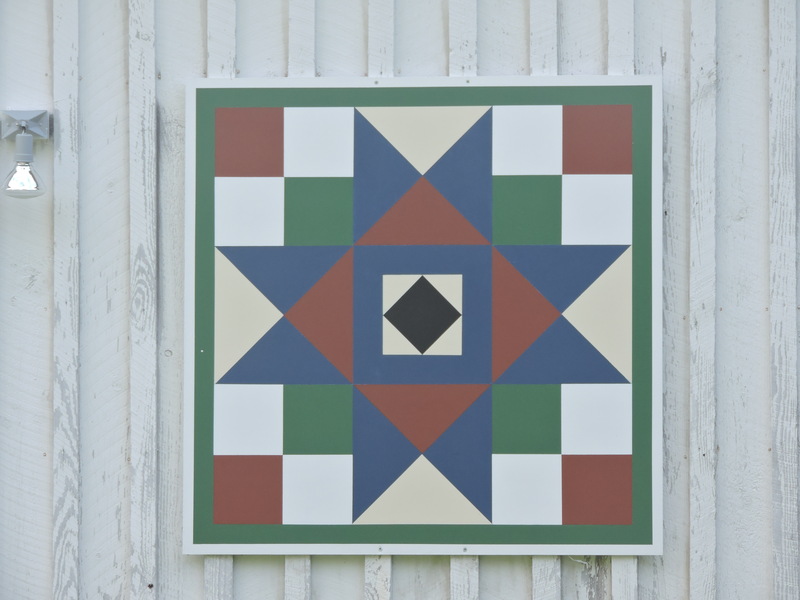 This square is a basic Ohio Star design, one that was part of my late mother’s Civil War Quilt, which she made in 2001. 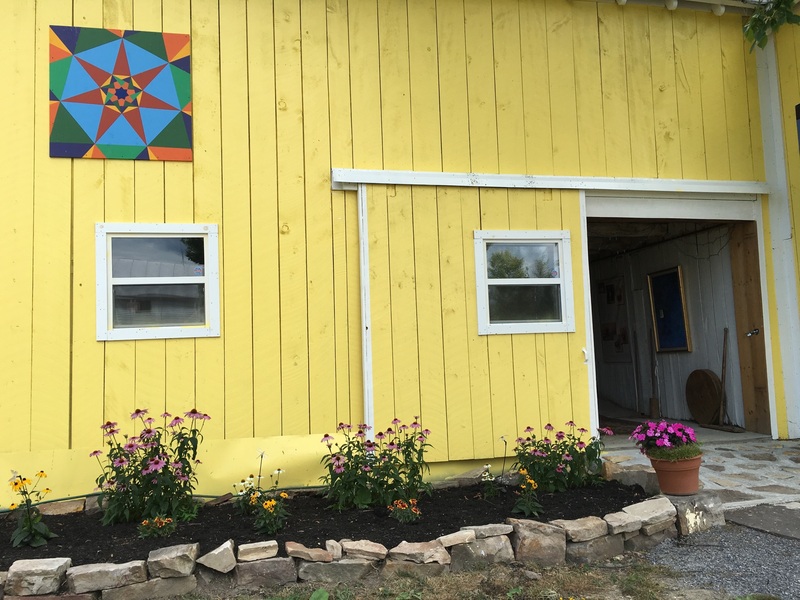 I chose the deep colors to complement the natural and barn colors on our farm. 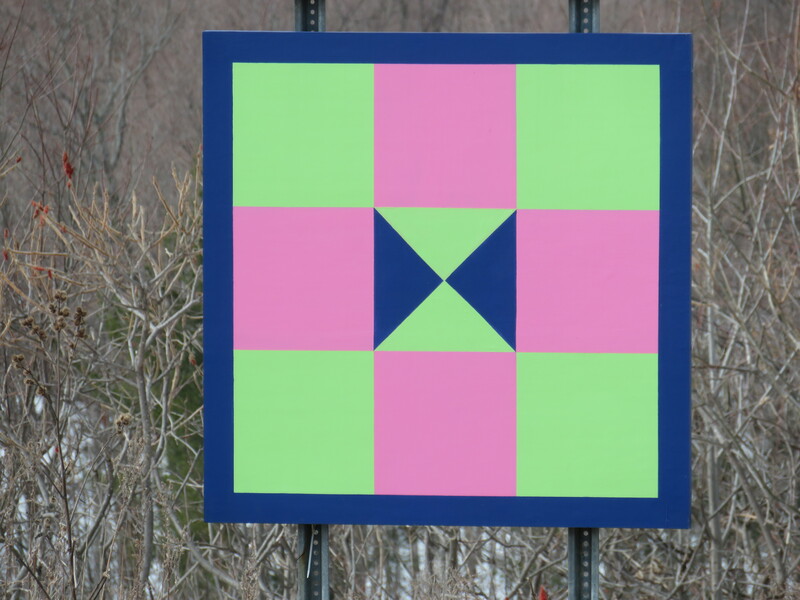 The center square is black, a tribute to quilts made during slavery days. 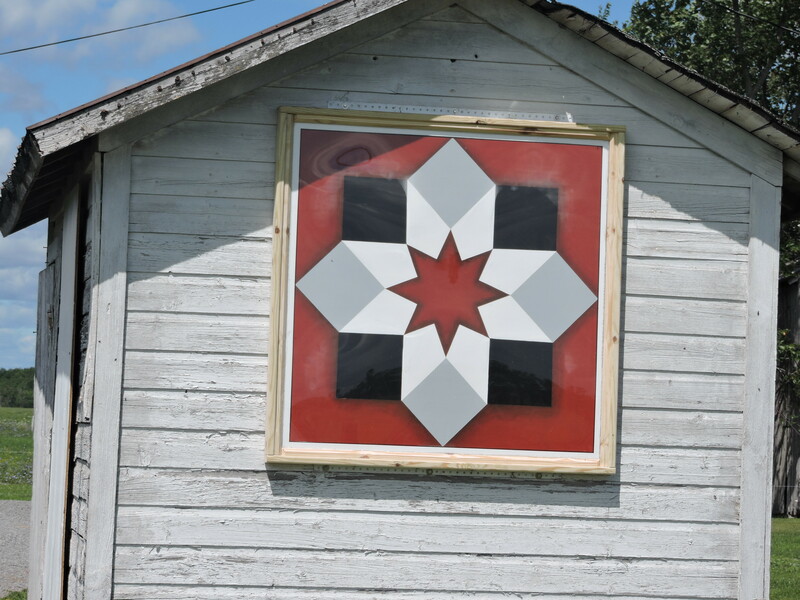 A quilt hanging on a line that contained a black square indicated a safe station on the Underground Railroad, which was “hidden in plain sight..” My husband and I have three African-American children; we tried to maintain parts of their historical heritage in small ways wherever we could, including in this barn quilt. 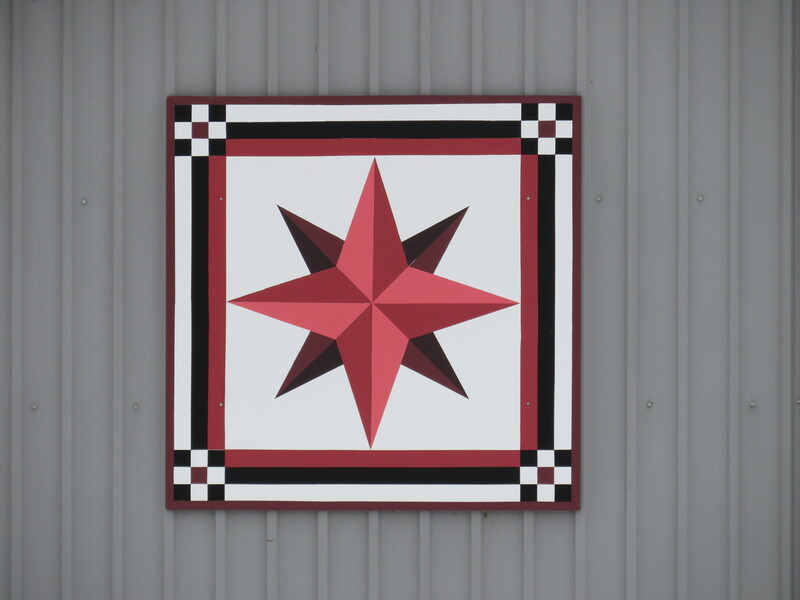 Carol loves the color combination of black and red, and chose a Mariner’s Compass block pattern that featured those colors. 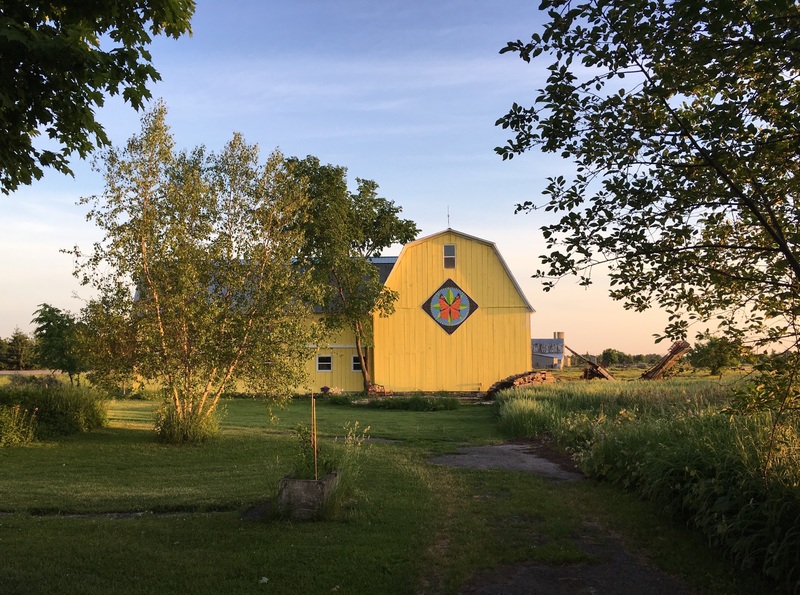 The barn has long served as Bill’s workshop and storage area, and they liked the alliteration of the title with their names. 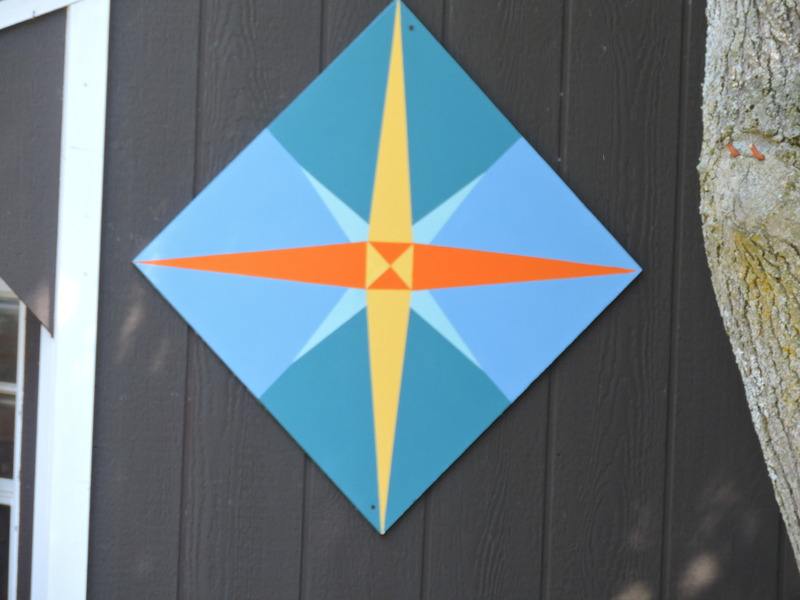 Like many others along the Hammond Barn Quilt Trail, we chose a Mariner’s Compass quilt pattern to honor our love for the river. 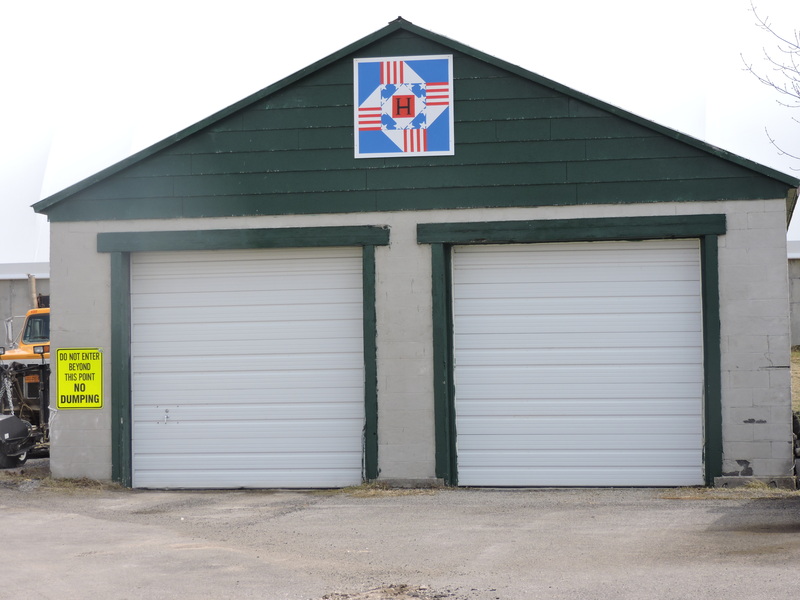 We particularly liked the colors in the block we found online – red and green for channel markers and blue for water and sky. 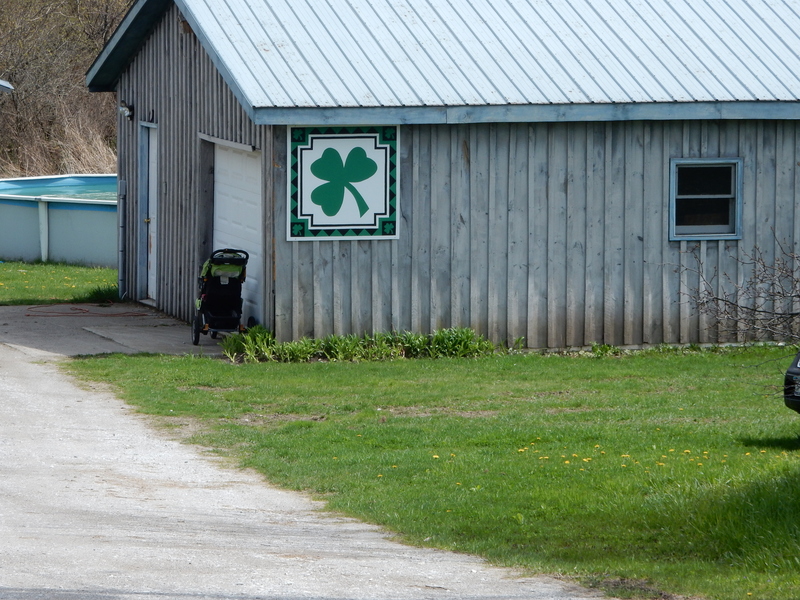 One of our goals when moving to our little “homestead” was to become more self-sufficient. A component of that, for us, is having Nigerian Dwarf goats. 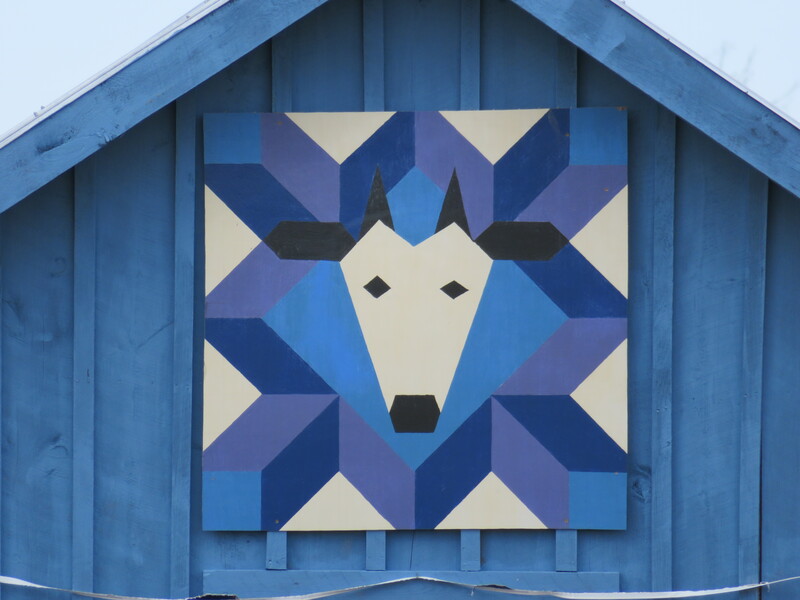 This barn quilt design is in honor of our first goat, Rachael. 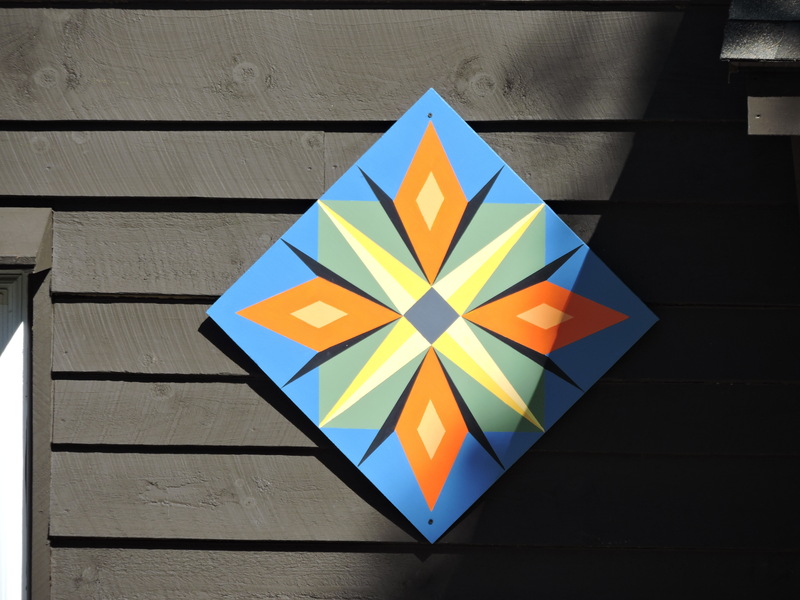 My quilt block is in honor of my husband and I gardening for many years in my River yard. The blue represents the water and sky, green the foliage, and pink the lovely blossoms that bloom throughout the season. The design ties the yard and the beautiful surroundings together. 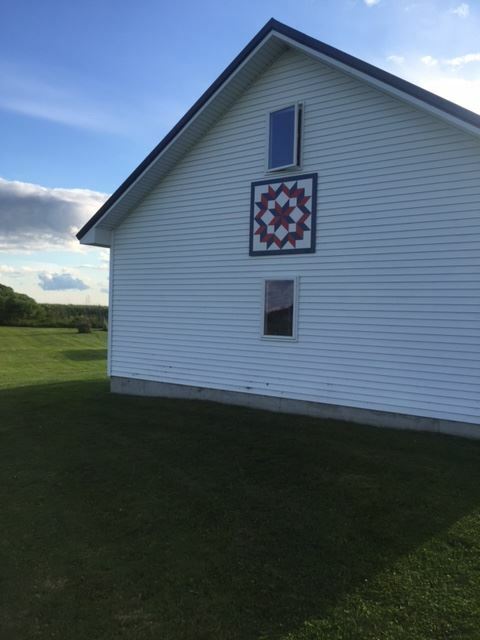 The Scottish Pride barn quilt is a loving tribute to my Scottish heritage and the McGregor family that has lived here for five generations. 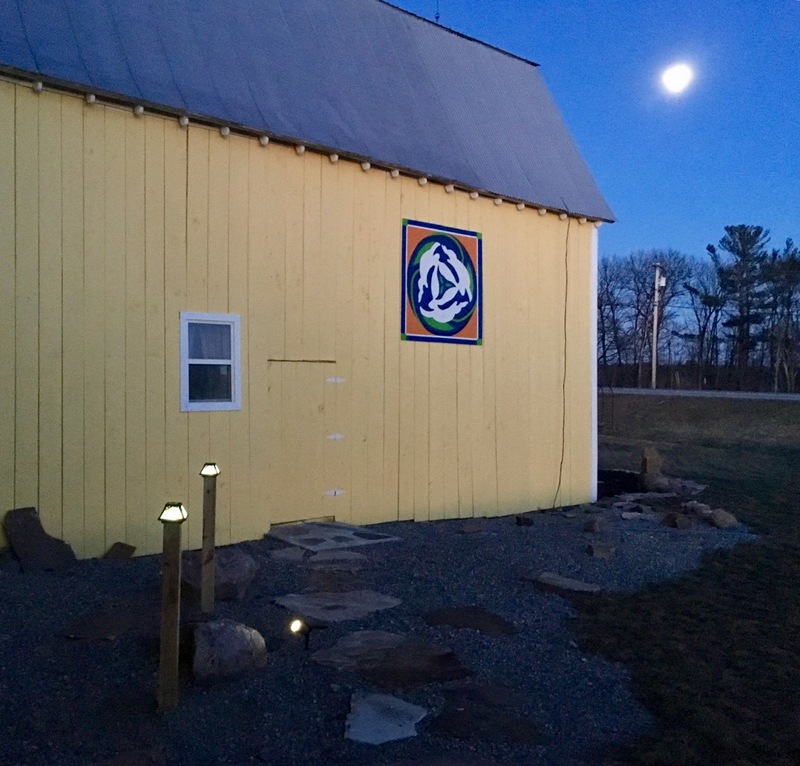 It highlights the Scottish thistle that grows in the garden here on the farm and the McGregor tartan plaid representing our Scottish family roots. A year round reminder of the splendor of sunsets on the St. Lawrence. I have a florist and bridal business here on our property catering to “Destination Wedding” couples who wish to marry here in the “Heart of the Thousand Islands”. We thought this pattern was the obvious choice! 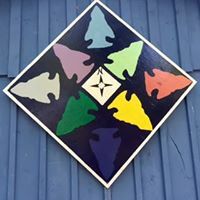 The quilt block was designed to represent some of the activities of the club. Tip-ups represent the annual winter fishing derby. 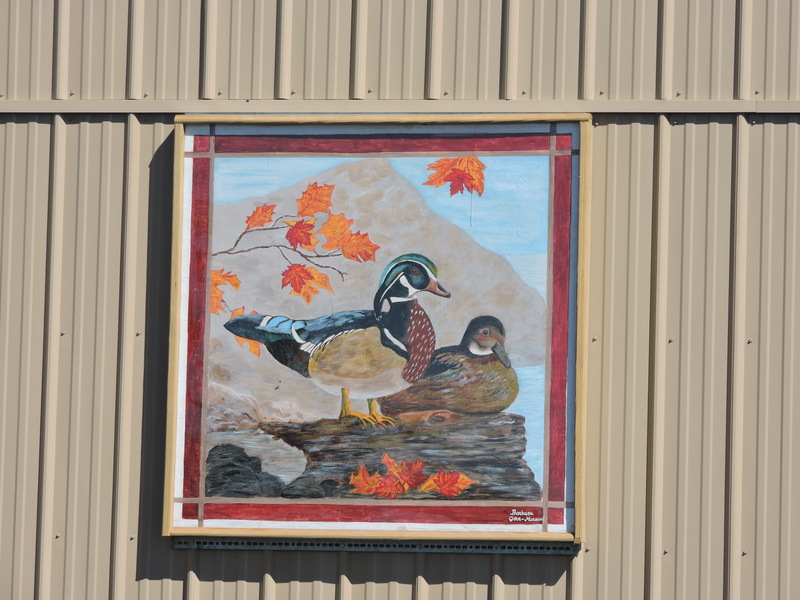 Wood ducks represent building duck boxes. 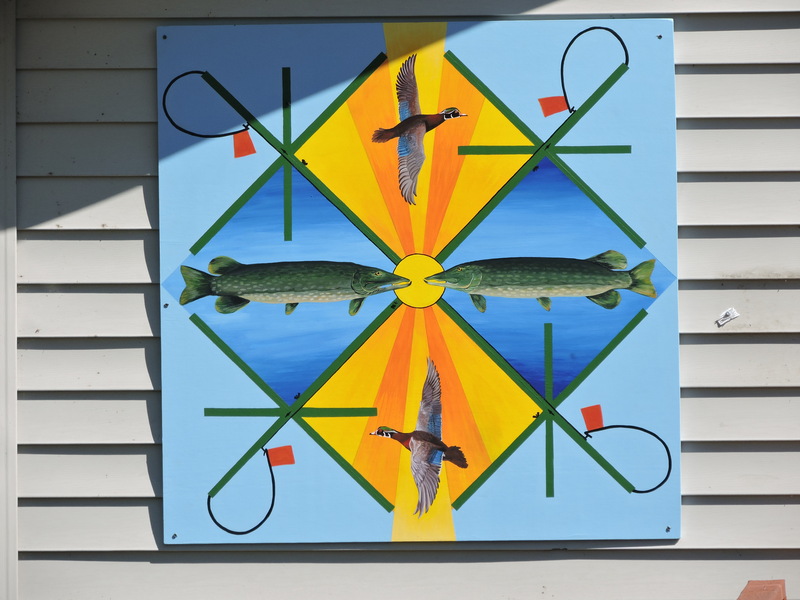 The Great Northern Pike represent the incredible fishing in Chippewa Bay. 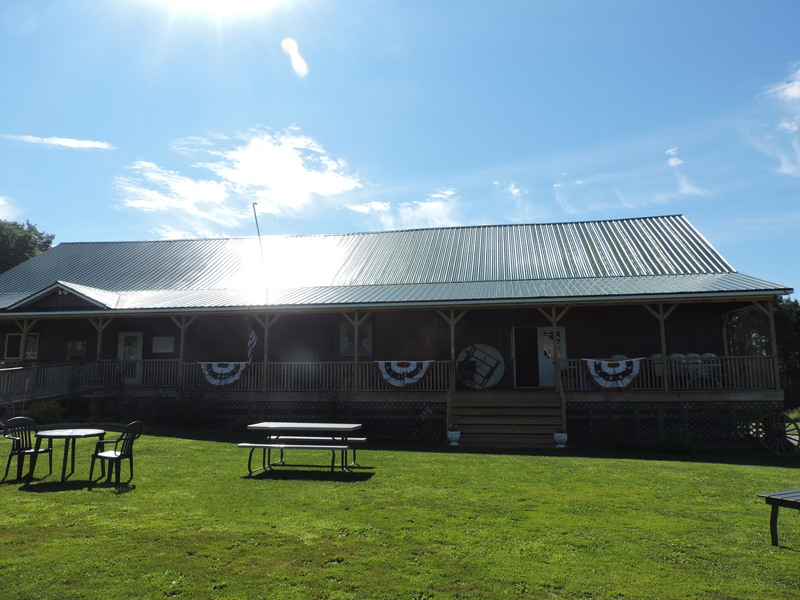 The rays of the sun represent not only the incredible sunsets over the river but the year round involvement of the club. 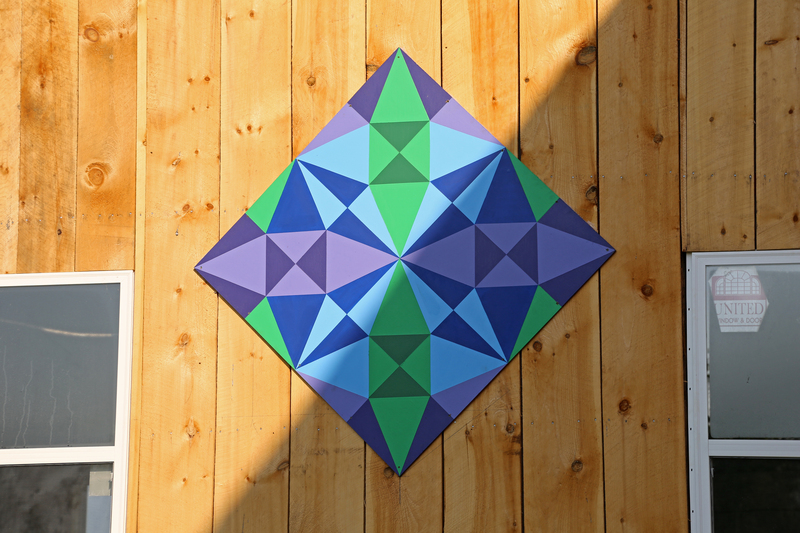 This quilt design was inspired by the awe and beauty of our flying species who contribute their part to the chain of life. 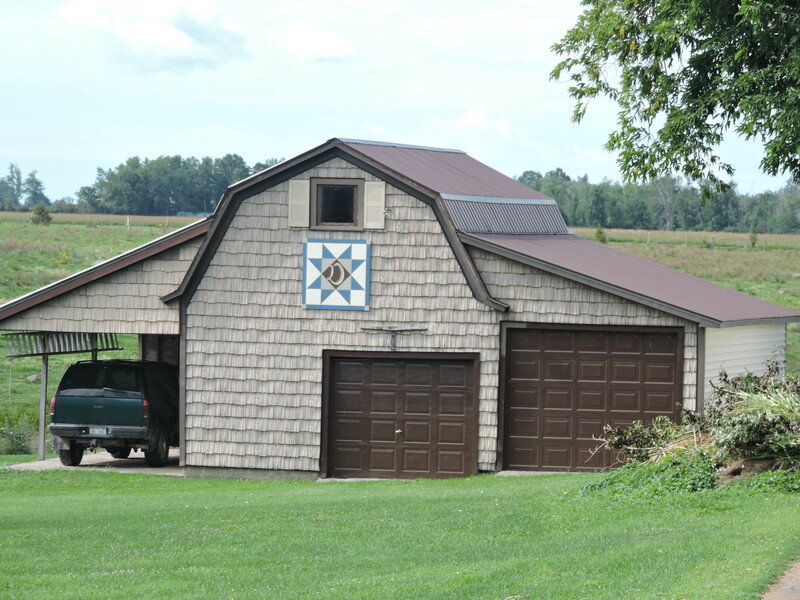 This 4’ x 2’ barn “runner” was designed to “fit the space”. I used the well loved design of Sparrows, adding sunshine and foliage. The piece was created to honor our scenic region, elements of growth and the promise of flight. 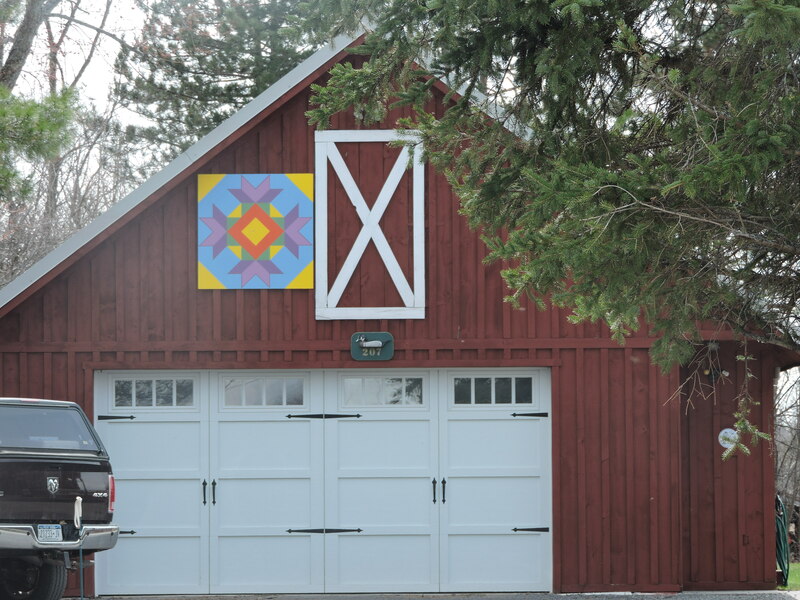 This 4×4 barn quilt was created to honor the complexity of the natural world. The name is Latin for Fish Diversity, and honors the differences in us. Forms are of all different colors, but swimming in unison and harmony. 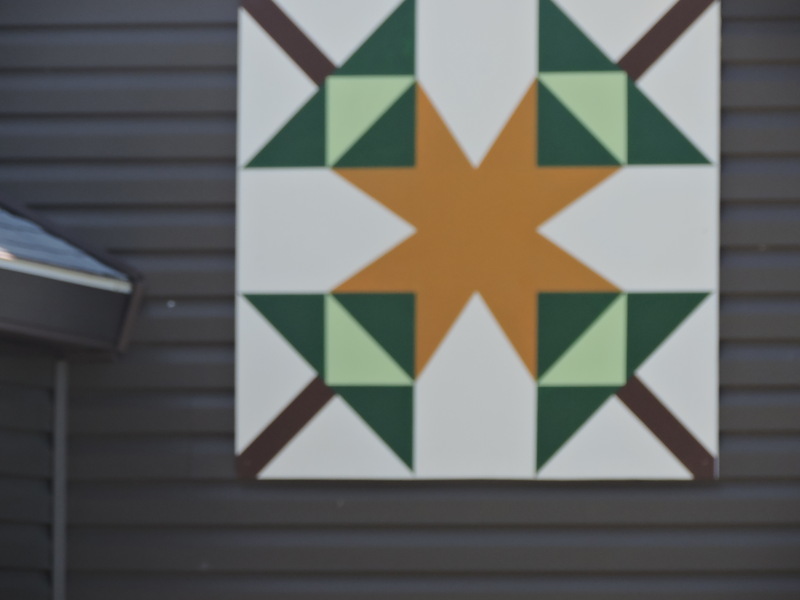 This quilt design was inspired by the simplicity and peace of mind of traveling on the river under your own power with your best friend and taking in all that the scenery has to offer. 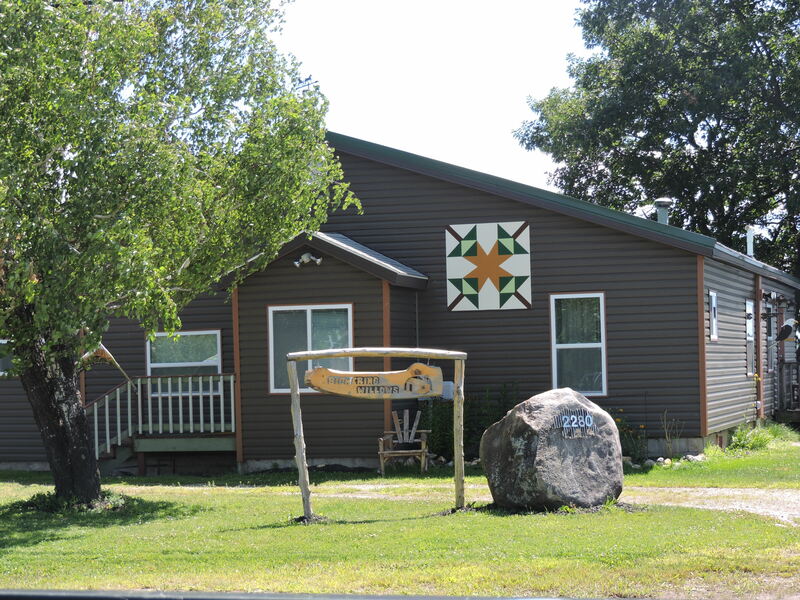 The quilt is in honor of Ragnavok Island in Chippewa, which we built in 1890. This is an outdoor ready picture by Michael Ringer, which he titled Sailing Skiff at Ragnavok Island. 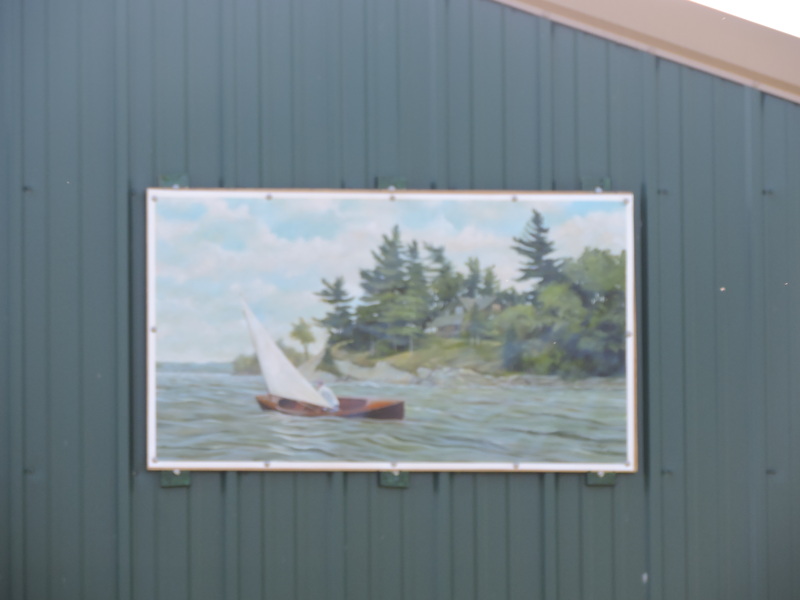 The figure in the painting is my father, Fitzhugh Quarrier, sailing his skiff in front of his island. This design incorporates the two types of plants that Monarch butterflies need to survive – nectar flowers and milkweed. 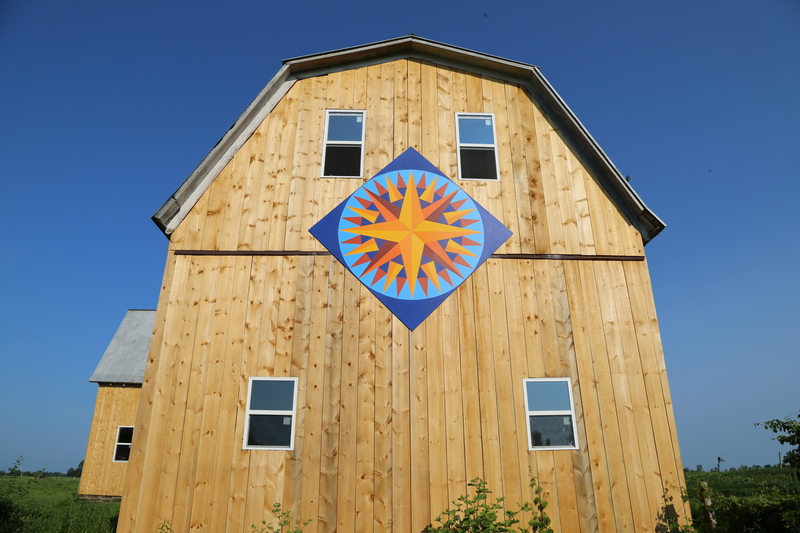 Painted in 2014, the barn quilt is a reminder for Americans to preserve and regenerate ideal habitat for Monarchs. I chose this pattern from a quilt pattern book. I wanted a simple pattern that would look good with my chosen color palette of white, black, gray and red. 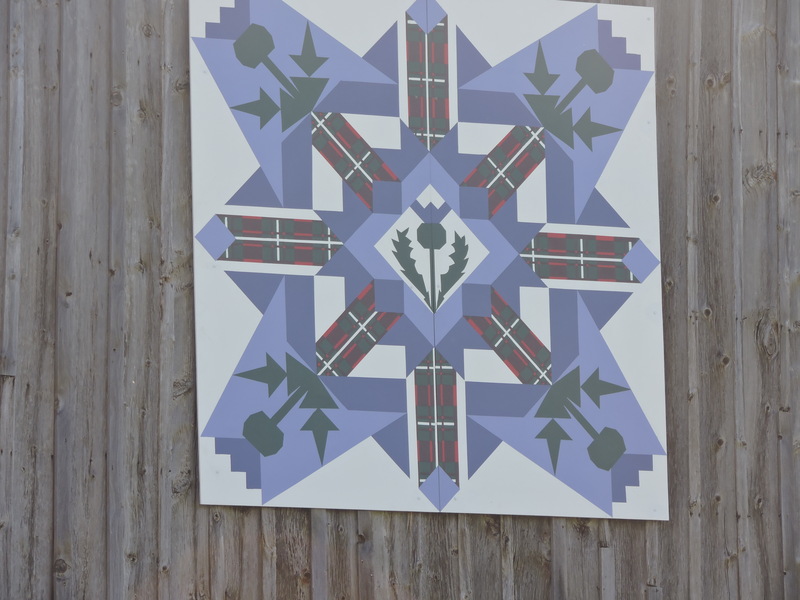 I chose this pattern because I wanted a traditional quilt block that could be painted to look like thistles, thus “Thistle Bloom”. 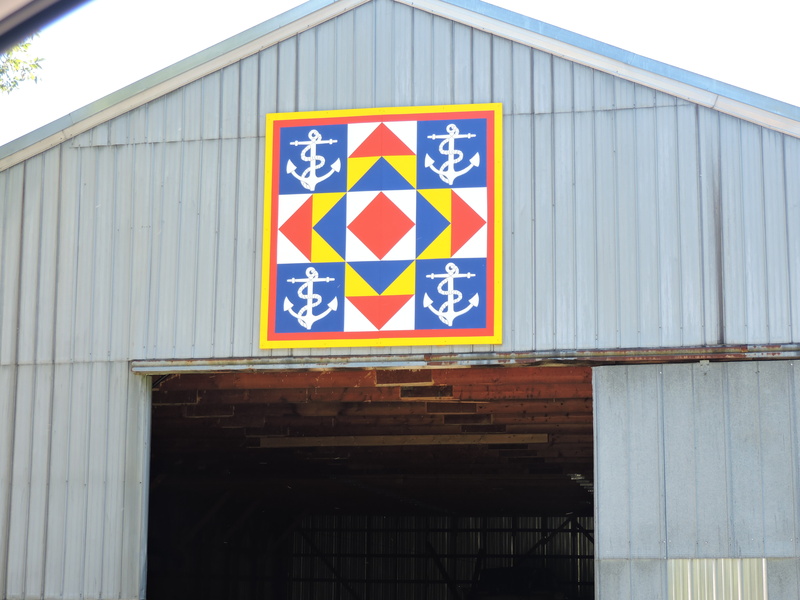 We wanted our Barn Quilt to show anchors for the Harbor and nautical colors for the Marina. 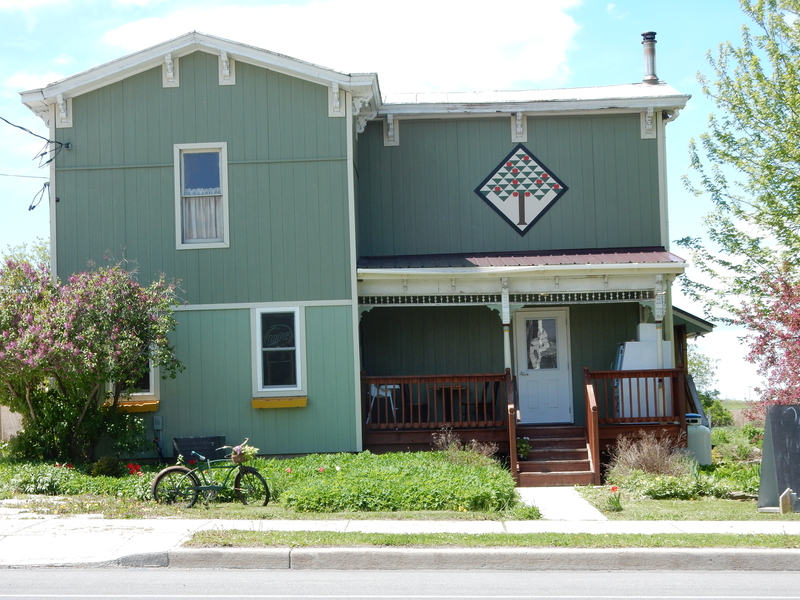 This block is an original interpretation of a block that dates back to 1897. It has several names, one of them being The Forbidden Fruit Block. I am calling my adaptation the Macsherry Trail Tree. 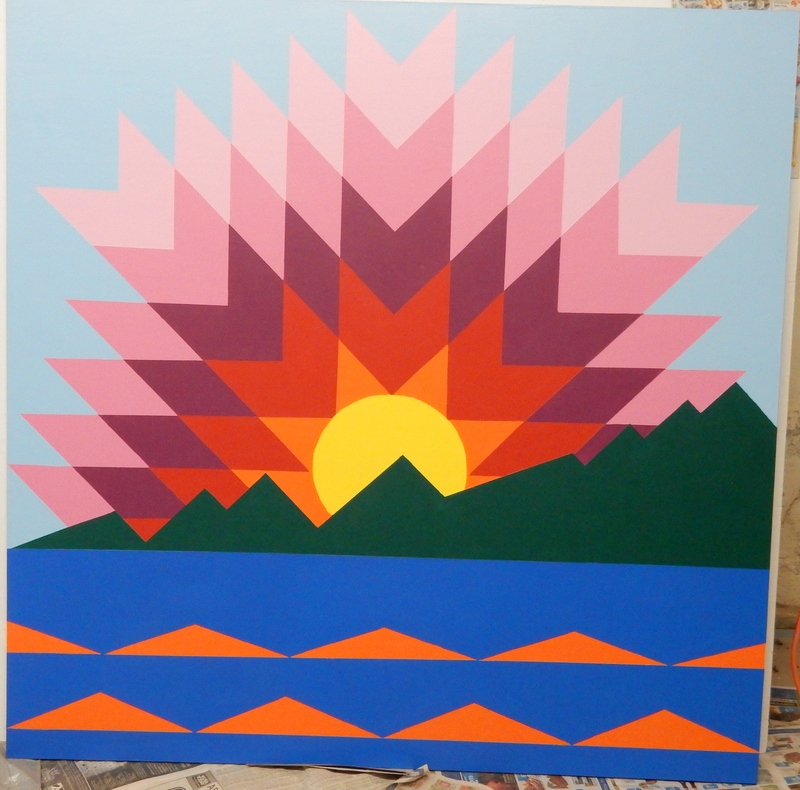 The color palette I have chosen is made of the many hues seen in The Thousand islands. The background is a warm blush often seen on the horizon at sunset. The diamond “leaves’ depict the color scheme of trailside weeds and wildflowers found in this area from early spring until after the first frost of autumn, all delightful times to hike on The Trail. And anyone who has ever hiked along this trail in early spring or late fall will never forget the many shades of brown mud. 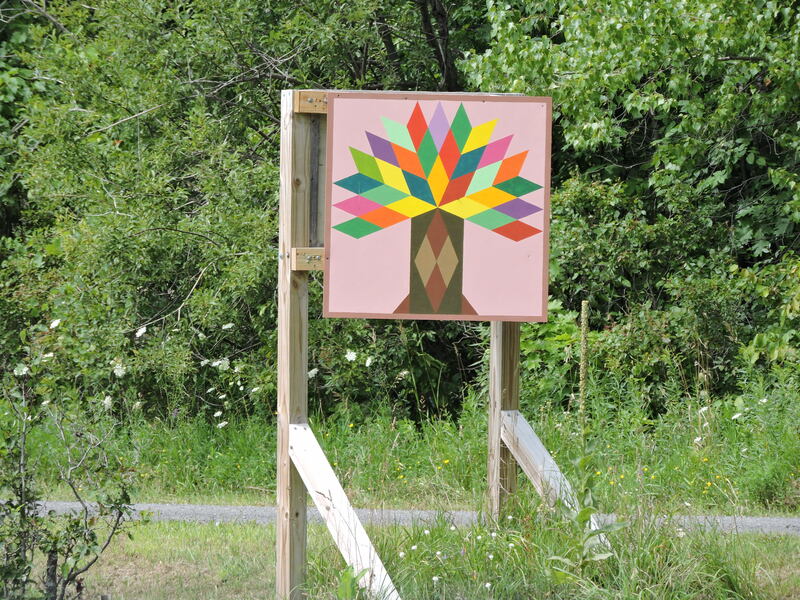 Please enjoy the colorful view of this Tree as you leave The Town of Hammond on Rt 12 and make the right turn onto Indian Point Rd to access the Macsherry Trail. 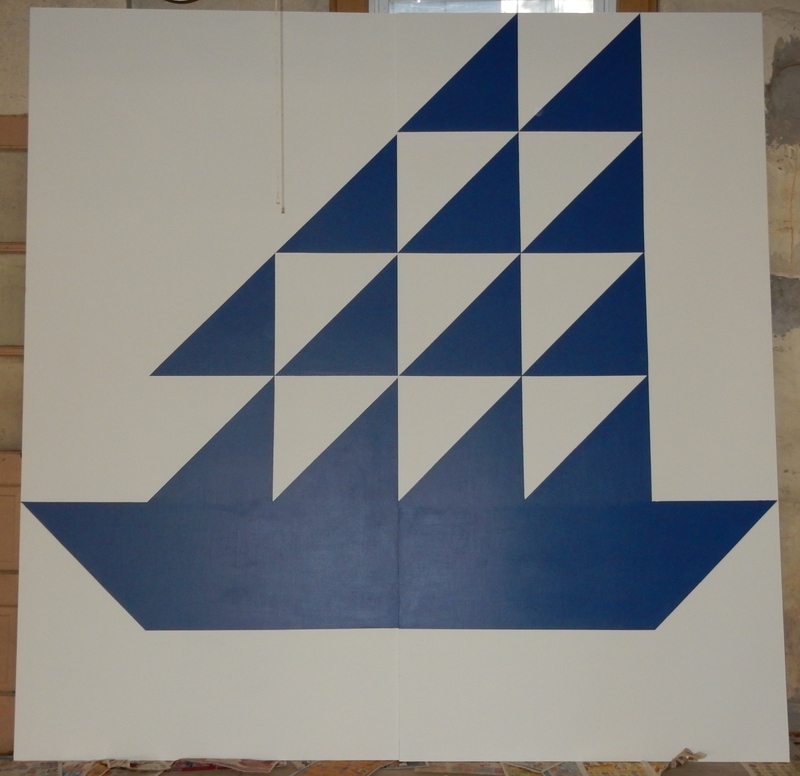 This design was chosen in honor of the Chippewa Bay Regatta. 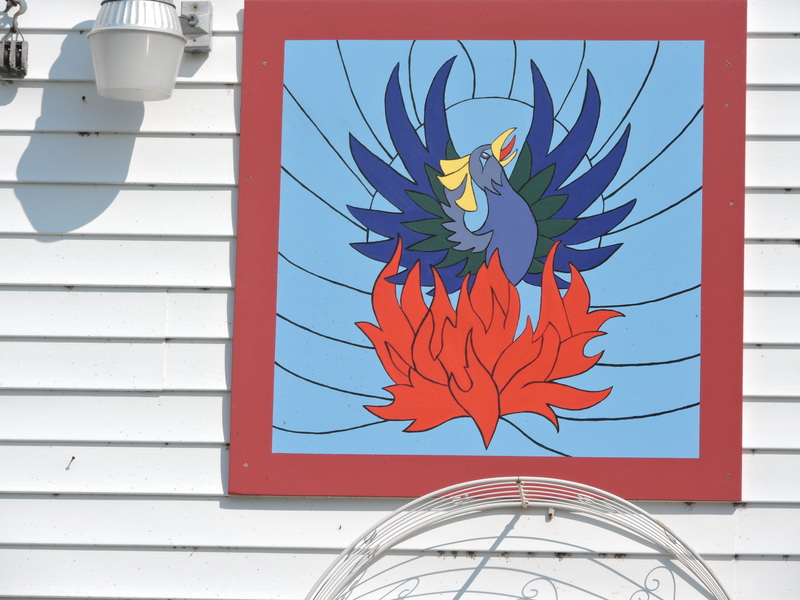 My shop burned down to the basement; it was my Mom who inspired me to bring her up from the ashes and call her Phoenix Fabrics. I dedicated the business to her in 1992. Mom has since passed on. 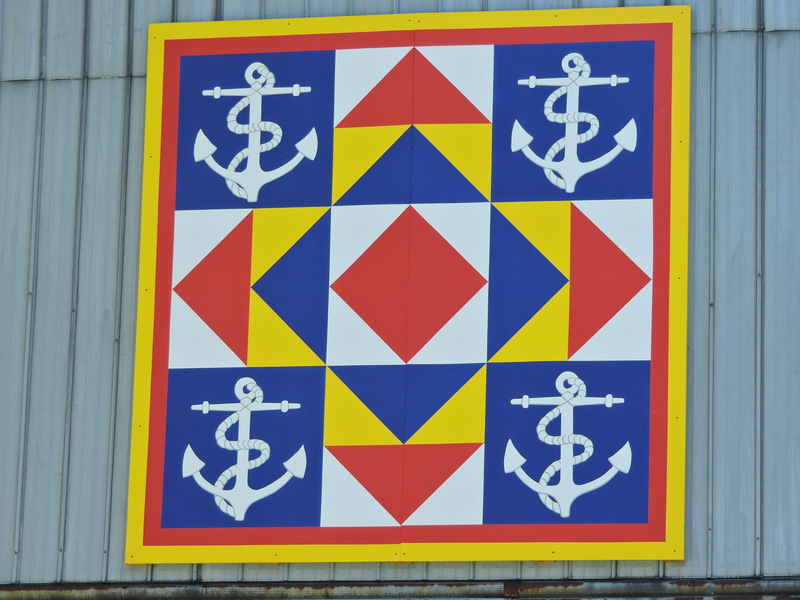 A nine patch quilt depicts the values, beliefs, and inspiration for our family on the river. This came from a family of sailboat people. 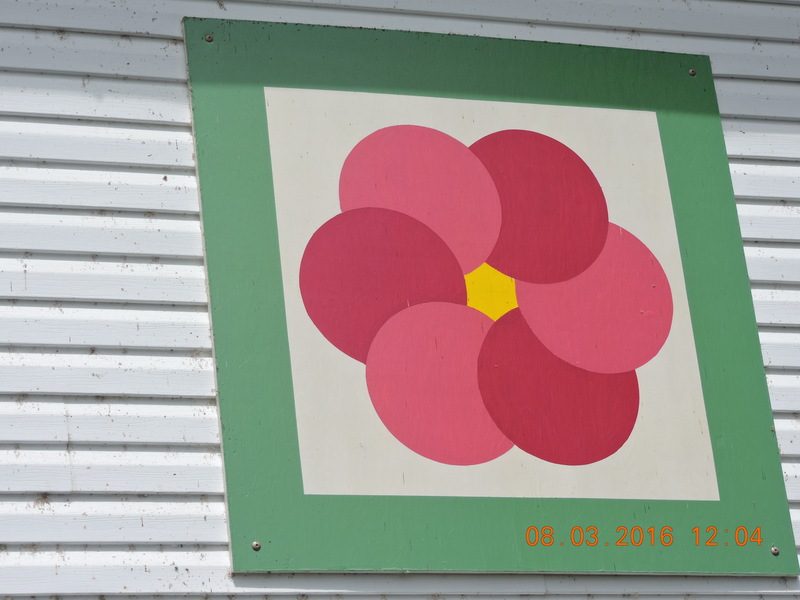 My Dad picked this quilt square because it looks like his wild roses. And I painted it to match the colors. 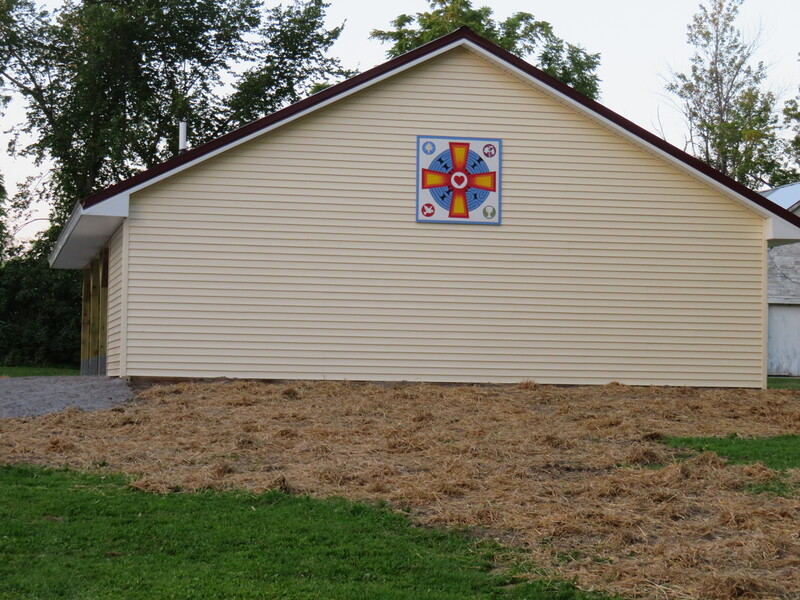 This was a church wide project. 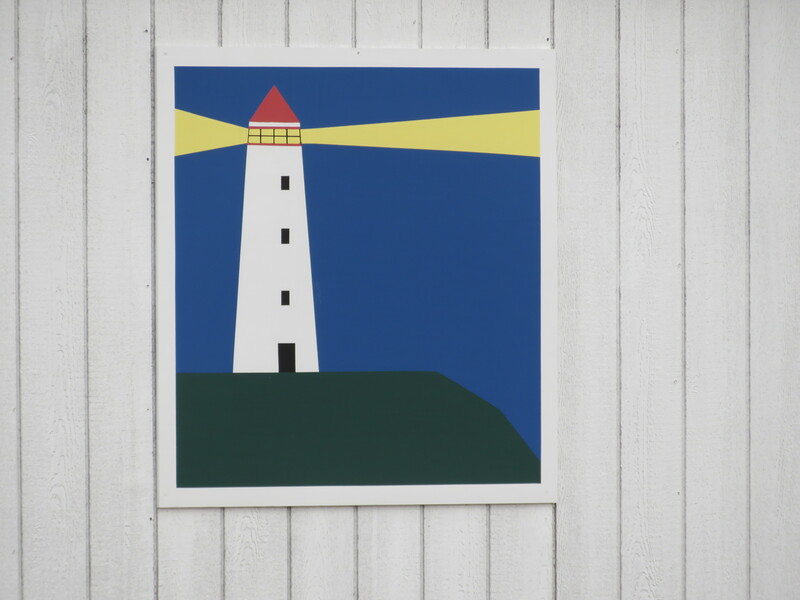 Pam Winchester created a black and white design template which the Sunday school children colored using some of the colors of the church seasons and symbols: green, blue, red, white and yellow. Pam chose color elements and ideas from their work to create the final design. The labyrinth represents the physical labyrinth laid out on the ground between the church and the manse. It is an ancient guide for walking prayer and meditation. It is open to the public. The large cross reminds us of God’s love and the heart in the center is another reminder that Christ’s love guides our work in the church. 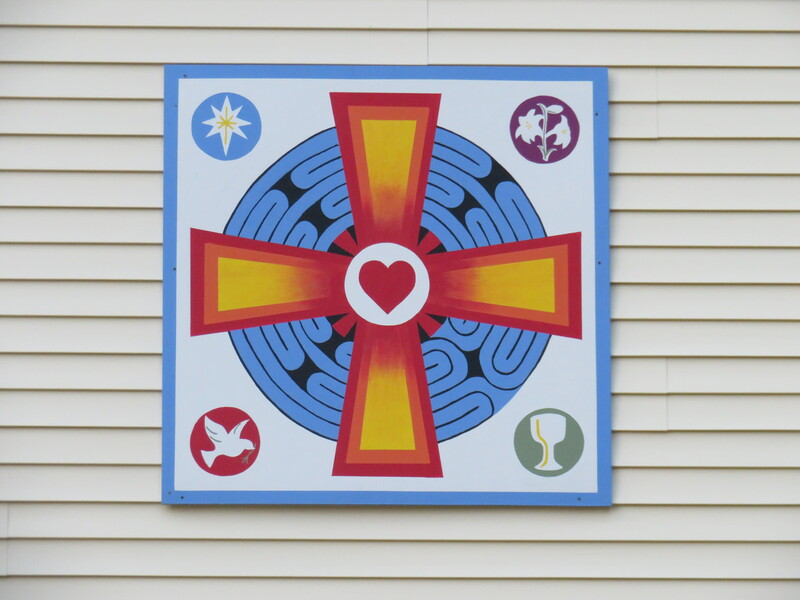 The Christian symbols in the four corners are a star, a chalice, a dove, and lilies. 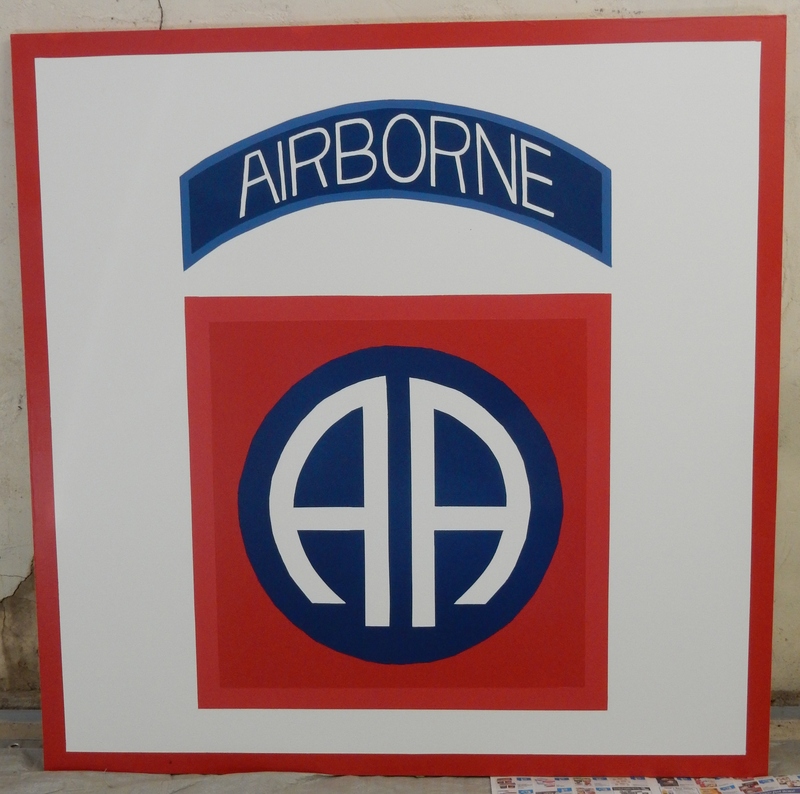 I spent four years in the 82nd Airborne. 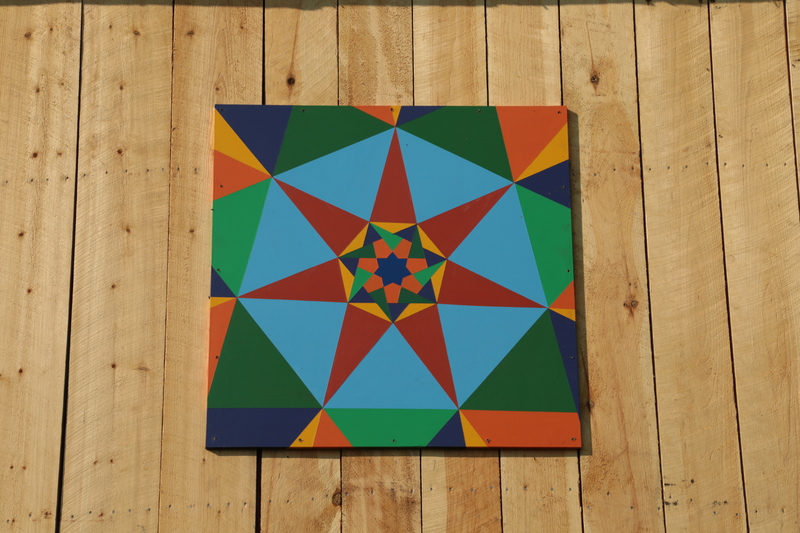 This design was chosen for its bright and cheerful colors and to represent the gardens that some of the residents enjoy planting. The Springtime Trillium has been a favorite flower of mine since childhood. Maybe it’s because it always arrived about the same time as my birthday! 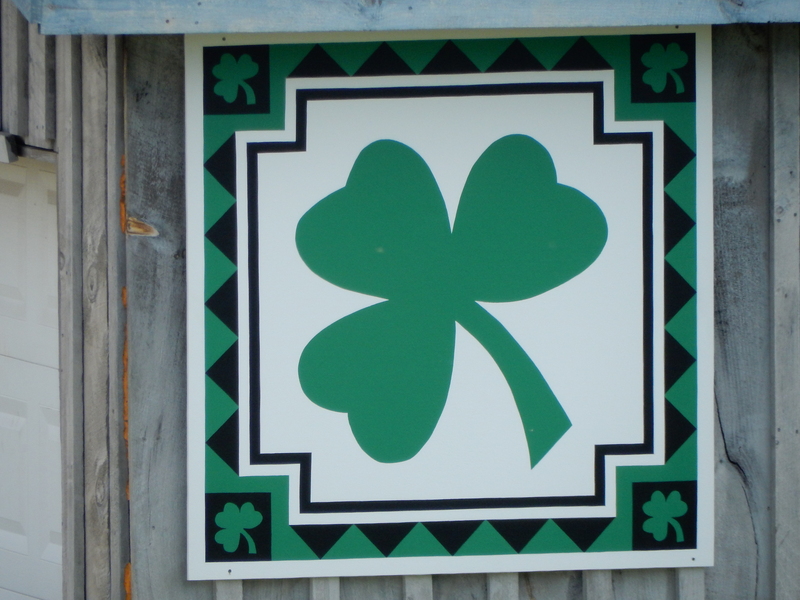 Irish heritage is strong in our family and the choice of the Green Clover is to symbolize this. “Storm at Sea” struck us as the perfect metaphor for farming. We are tossed about by forces that are often beyond our control, but we still would not choose to do anything else! 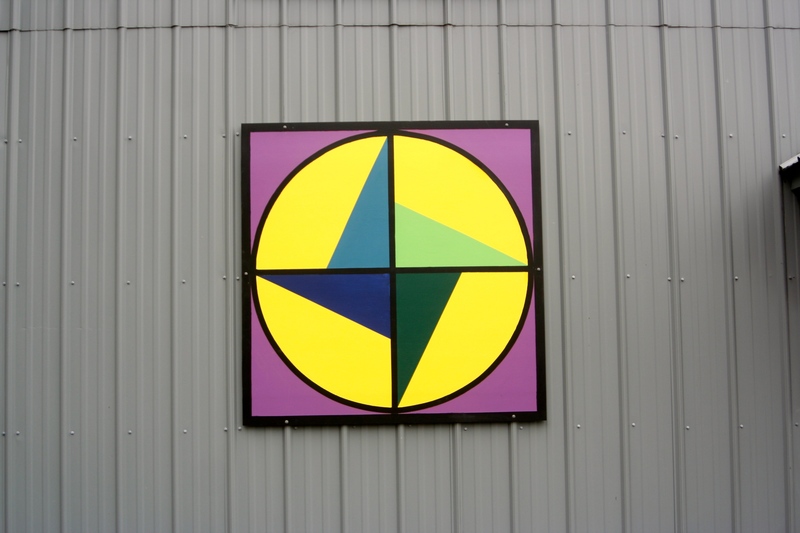 The colors honor the elements that we depend on: energy from the sun, the earth, water, and growing crops. Two corner images feature the dairy cows, on whom we depend. The other corners feature tractors, which help us take good care of the cows. 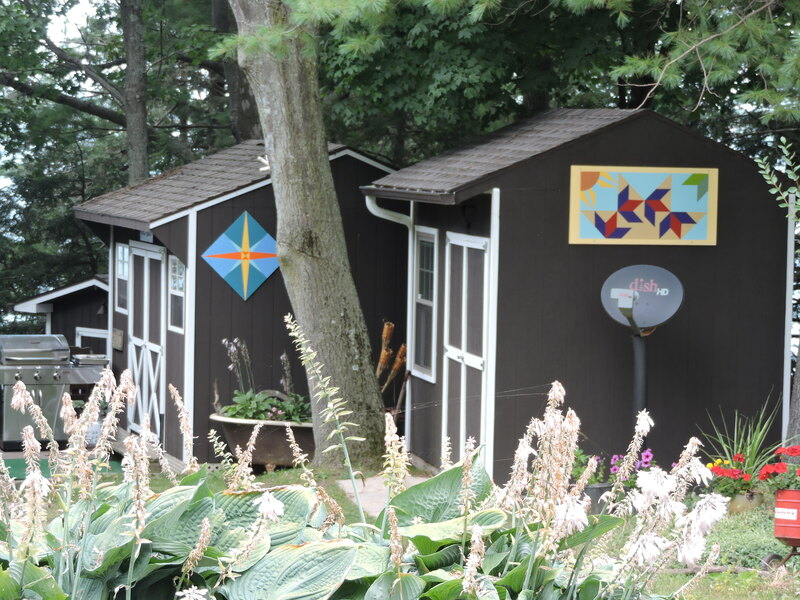 We chose Mariners Compass because of our location on Chippewa Bay. On a boat trip cruising the Rideau Canal, we stopped at a canal gift shop in Merrickville, Ontario. 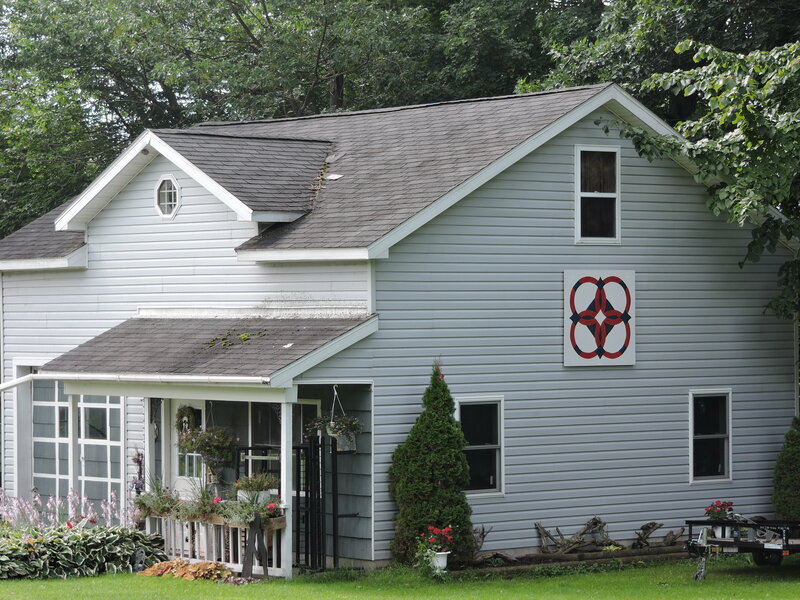 It was there that we purchased a hand quilted loon pillow, which served as our inspiration for our barn quilt square! 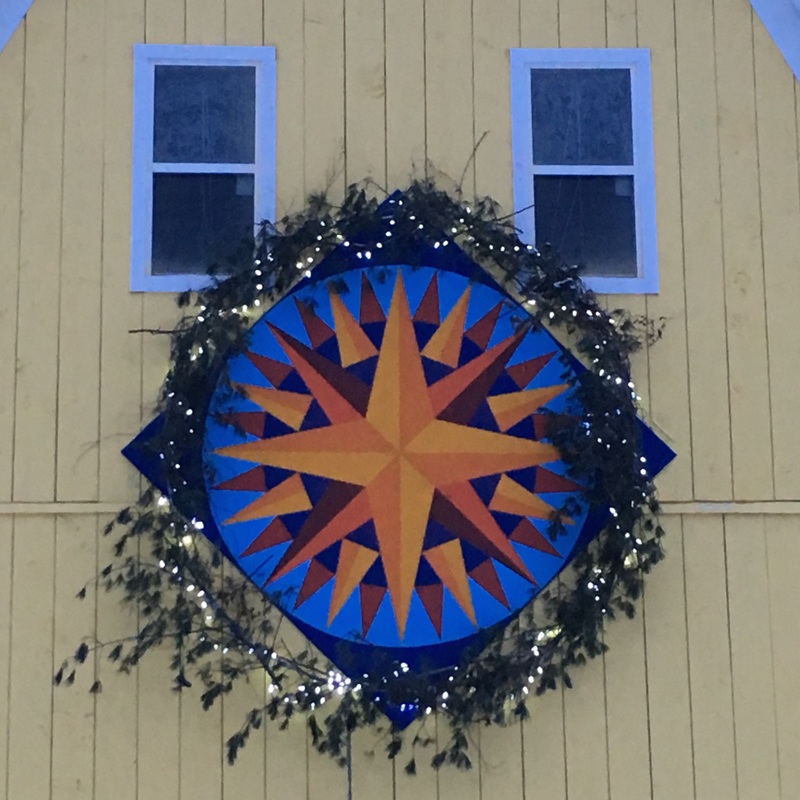 The Sail Star design was created to celebrate all of the fun filled sailing adventures our family has experienced over the years on the St. Lawrence River, Lake Ontario and Lake Champlain, San Francisco Bay and Buzzards Bay, MA, the Atlantic Ocean, the Chesapeake, BVI and the waterways in between. My inspiration for this piece is just below the surface of The River. Think of seven shoals, all intertwined, unable to be separated. My palette reflects the many shades reflected on and into the water rippling over the River rocks. Sometimes your eye will see stars, but more easily recognized are the stacked blocks. Snap a picture and then view it in black and white and gray tones. The basic repeating unit of this piece is a 60 degree diamond, the result of dividing a circle into six equal parts. The Seven Sisters block this design is based on dates from the late 1800s. The use of color makes it look very modern. 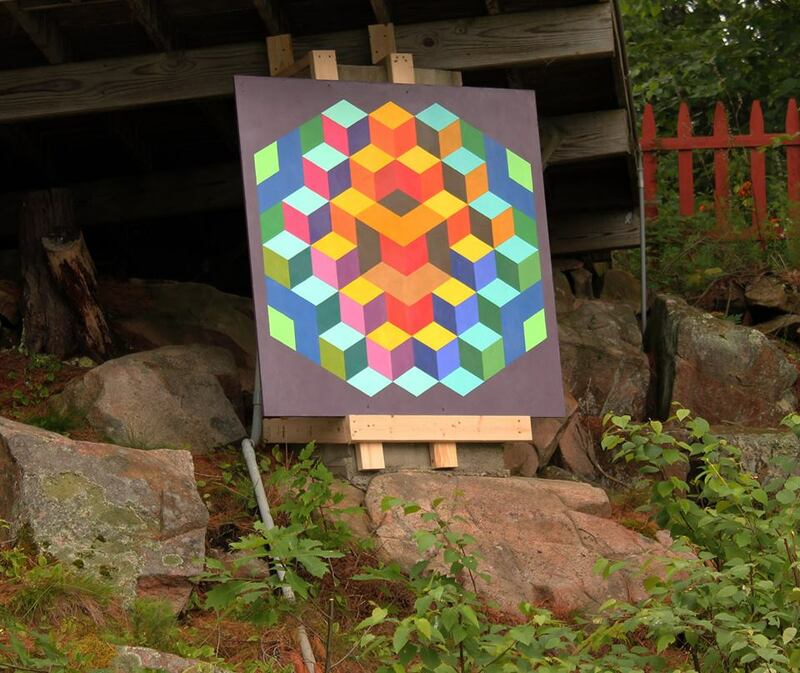 The op artist Victor Vasarely used this unit in many of his paintings. 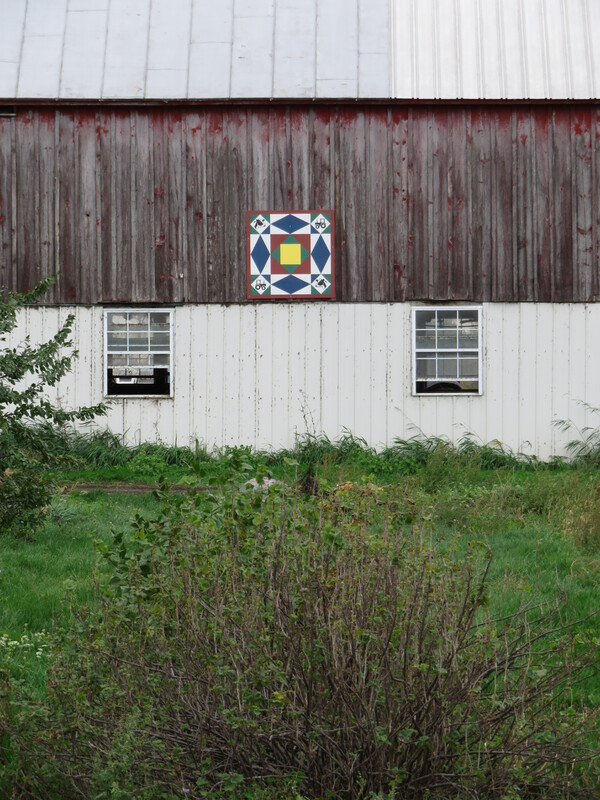 This Barn Quilt is visible from the water. 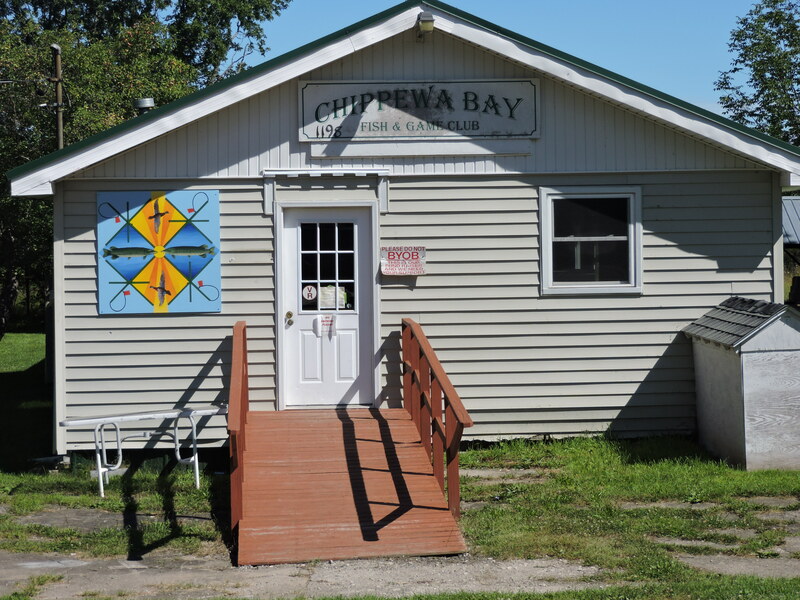 It is located near the end of Indian Point Rd., on the southern edge of Chippewa Bay. 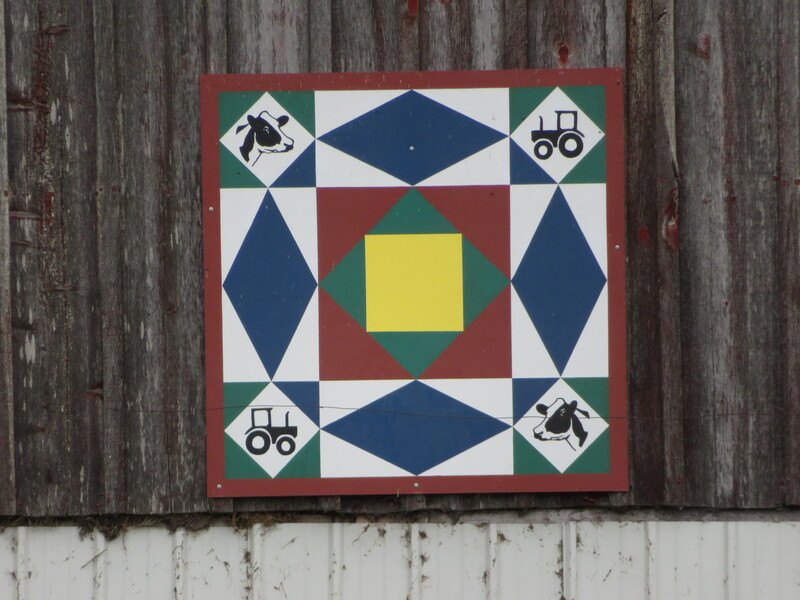 As a native Ohioan, I searched for a quilt that would represent my rural heritage. 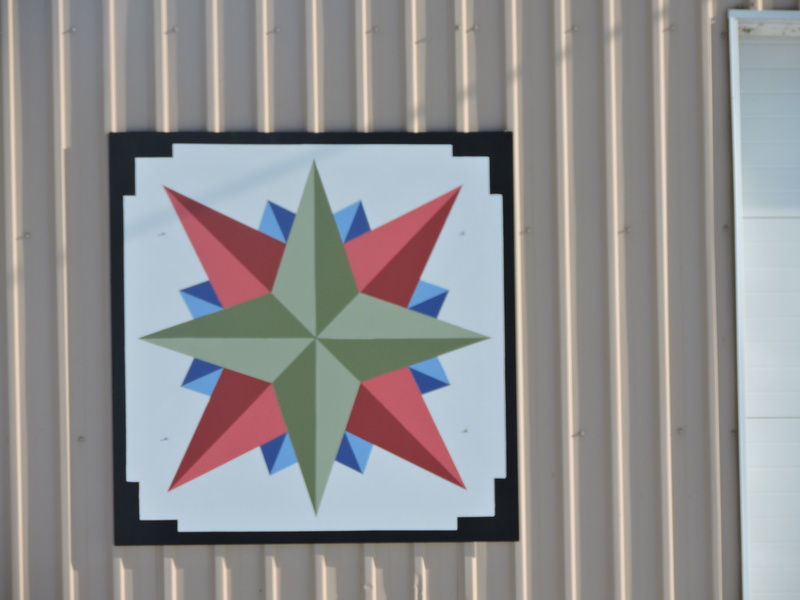 The Ohio Star provides an interpretation of the pride of early Ohio farmers and settlers, and it makes me smile every time I look at my quilt. 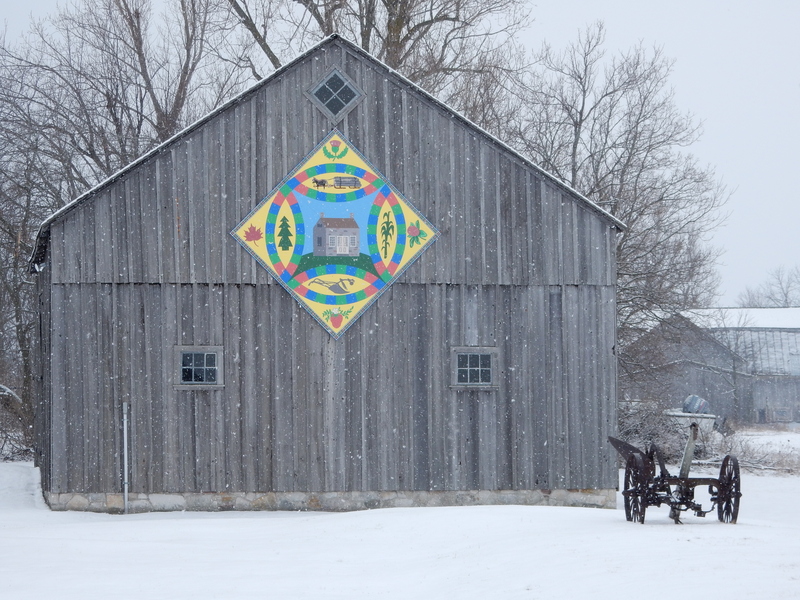 This barn quilt faces Black Lake. 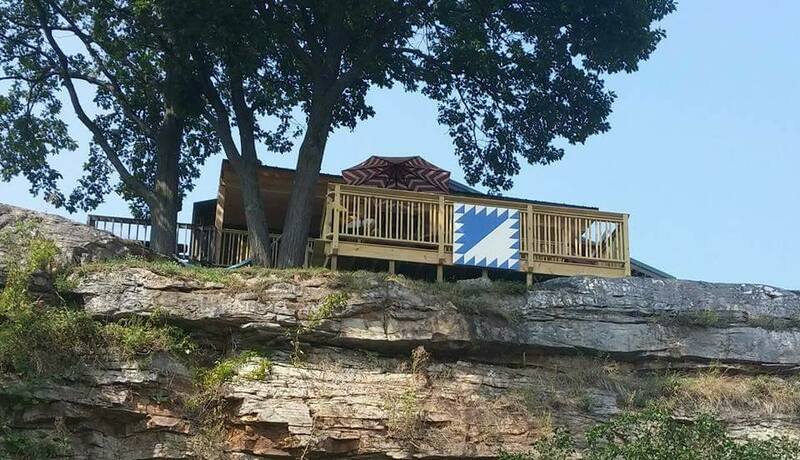 The reason this was chosen is because it is on the Lake and the color blue is called “Sailor’s Bay” in honor of my father, who was in the Navy in WWII. This was his house before he passed away. The smell of the coal forge and the sound of the ring as the hammer hits the anvil bring great memories of the several blacksmiths in my life. My Great-Uncle Briere in the early 1900s was a blacksmith. 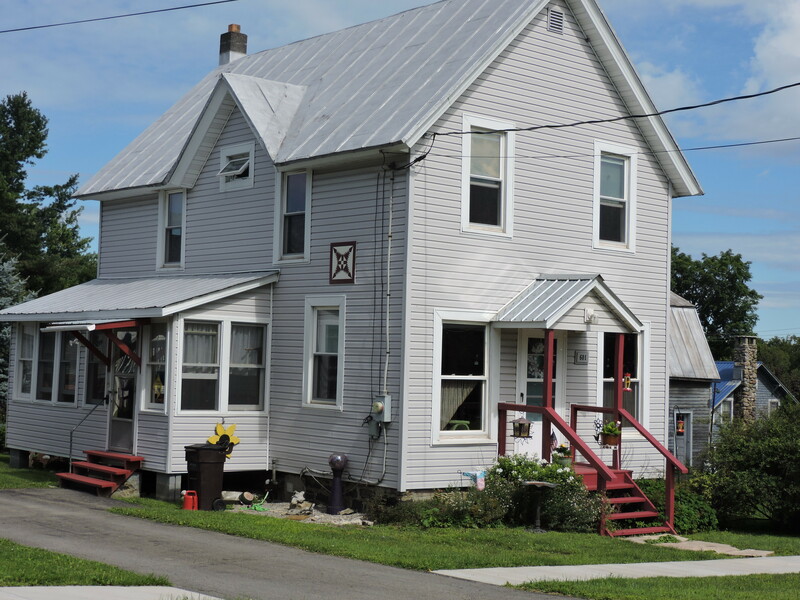 Our friend, Norman Martel, a blacksmith in the 1970s, taught the trade to my husband, Marty. Today Marty owns “The River Forge” Blacksmith Shop in Morristown, NY. Many days you can find Marty at the anvil sending sparks flying as he creates period hardware, brackets , tools and much more. 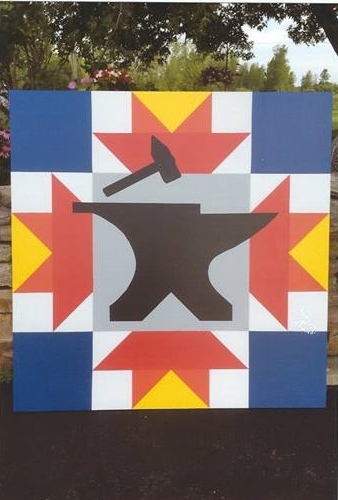 The anvil pattern represented one of the necessary and important activities of the early settlers – blacksmithing. 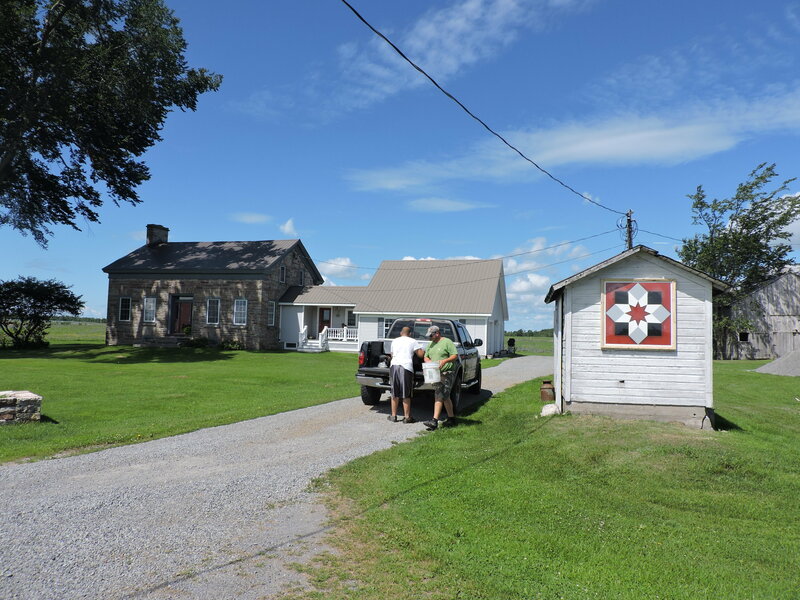 Not only did quilt patterns reflect the daily work of the women who helped to homestead, they told the story of the challenging work of the men. 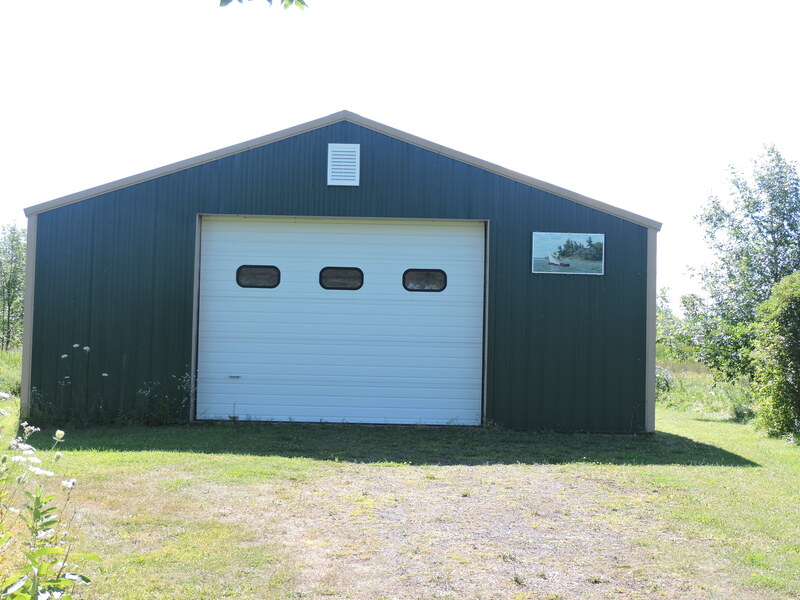 The summer of 2014 I purchased my new home at Winter Green Bay which included owning my first barn. 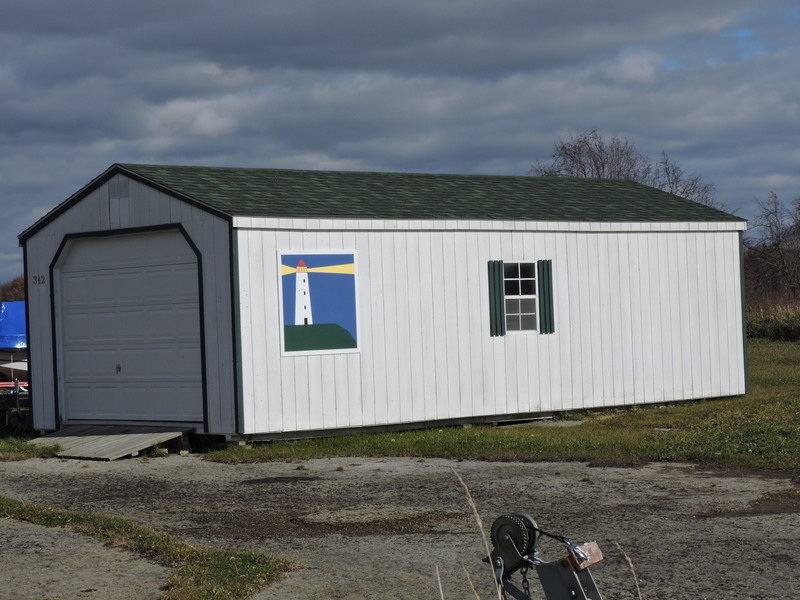 At the Hammond fair that same summer was a booth with information regarding the first St. Lawrence County barn quilt trail that piqued my interest. I thought it would be a nice community project to get involved with at my new location. I checked out quilting books from the library and started researching ideas. My new neighbor, Robert Paul Rice, took me and other friends on an archaeological dig to find Saint Lawrence Iroquois artifacts near Pleasant Lake. We found several pieces of clay pottery and beads, Flint arrowheads, bone sewing awls, turtle shell’s, animal bones and burnt corn. He is a wealth of knowledge about the native Americans that inhabited this area. This trip inspired me to create my own quilt design to honor these early hunter gatherers that lived at my location thousands of years before me. 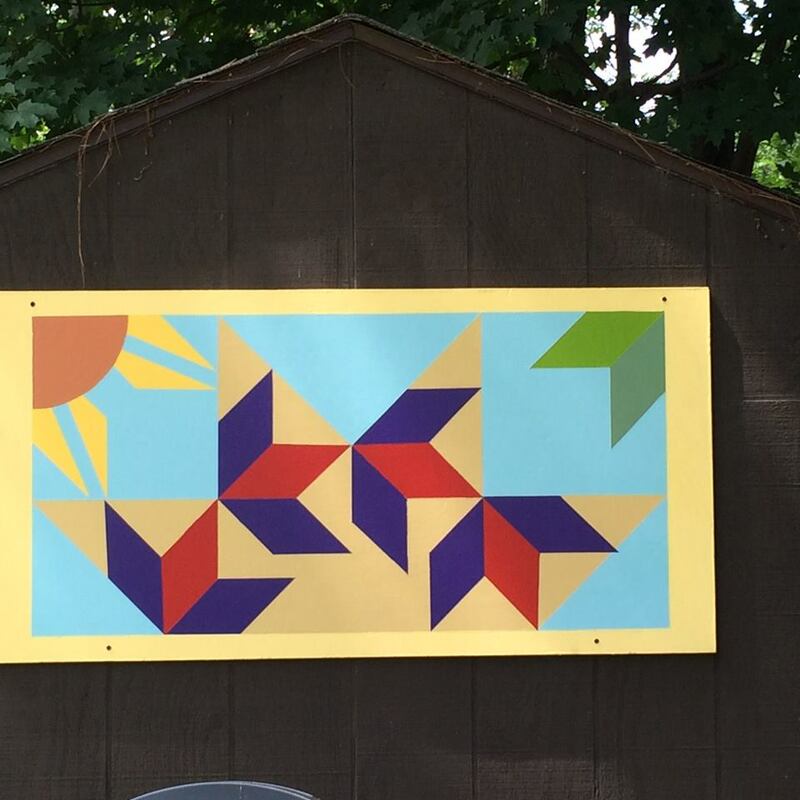 I included my friends and new neighbors in the project and they were all helpful and started giving me “scraps “of paint to use on the quilt. Even my curious cat was trying to be helpful, leaving her paw print behind. The spinning arrow represents my life finally hitting its target at my new location. Thanks for the brochure. I really want to make the tour after seeing this. 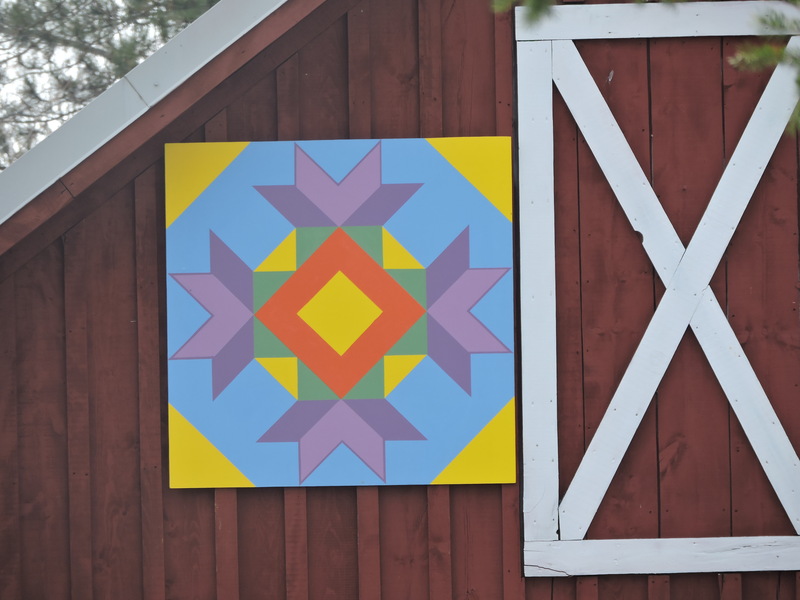 I would love to see photos ,of these amazing barn quilts , placed next to their written explanations. We’re working on updating the website with photos. Please stay tuned. 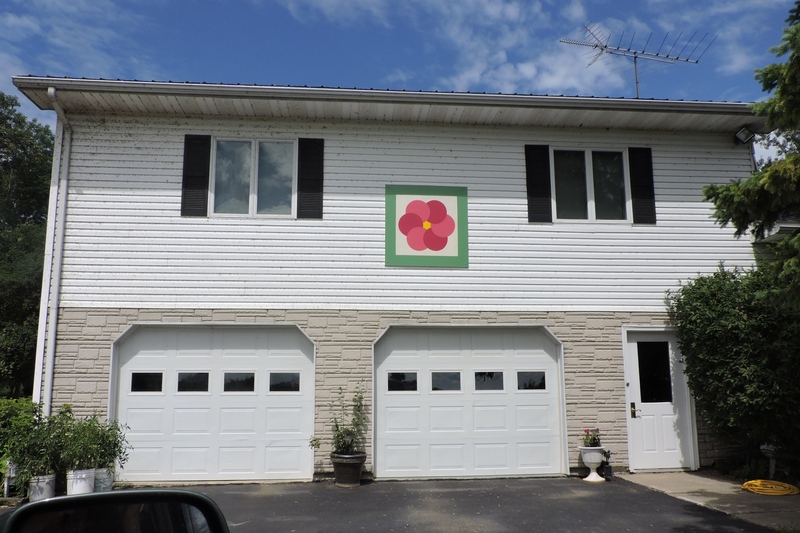 It is exciting to see the images of the barn quilts! The web site trail is blossoming! 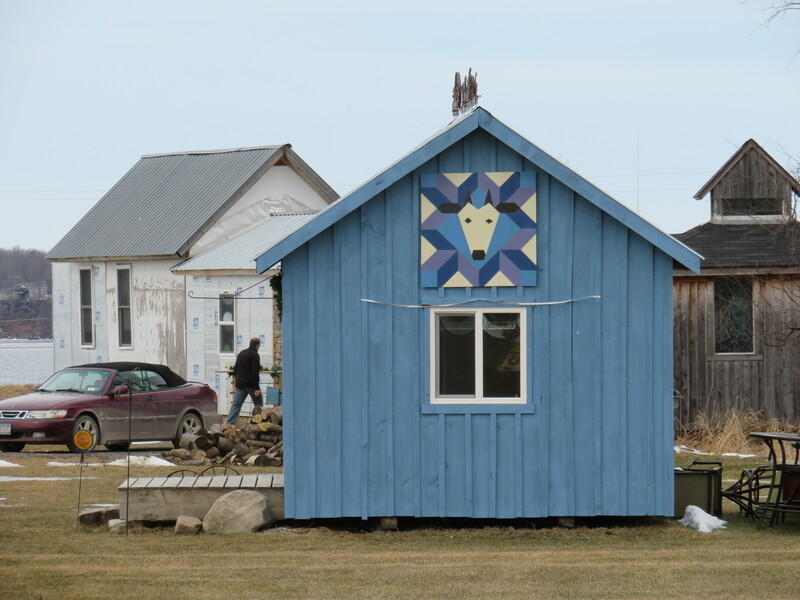 And to update; Mickey and Marty Syne’s block- “The Village Blacksmith ” is up and it is stunning! !